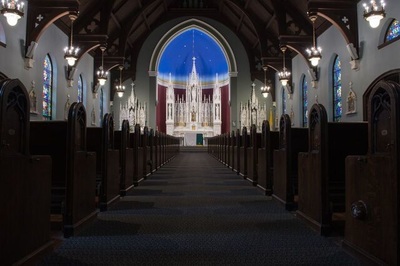 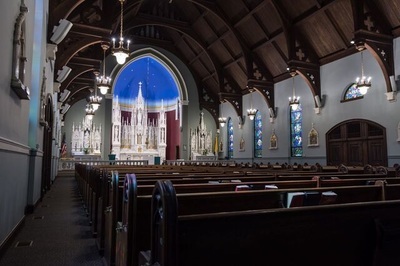 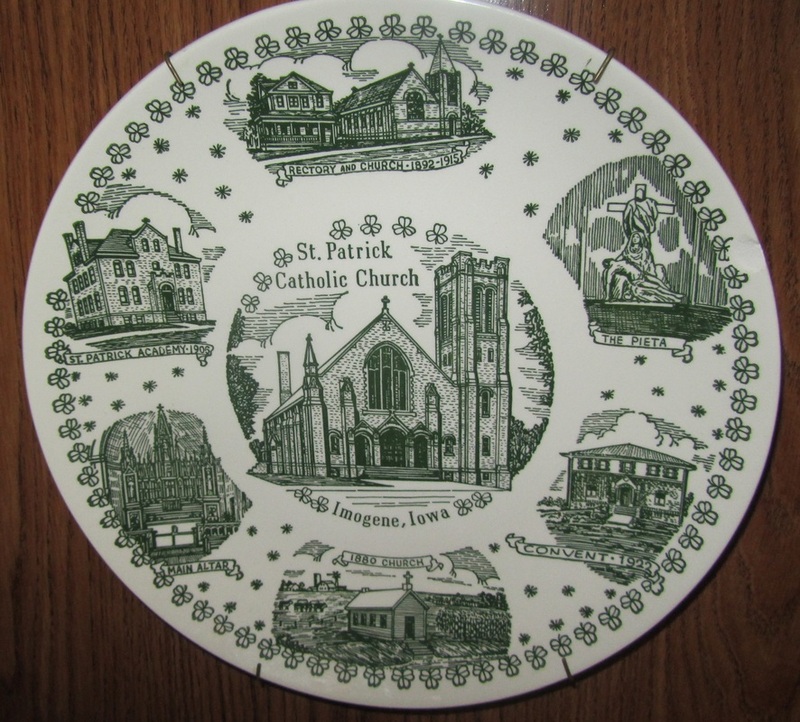 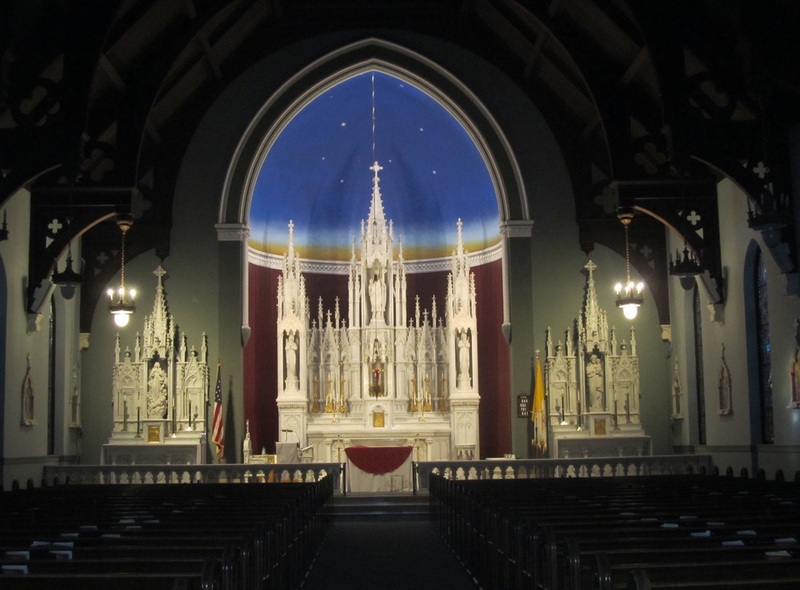 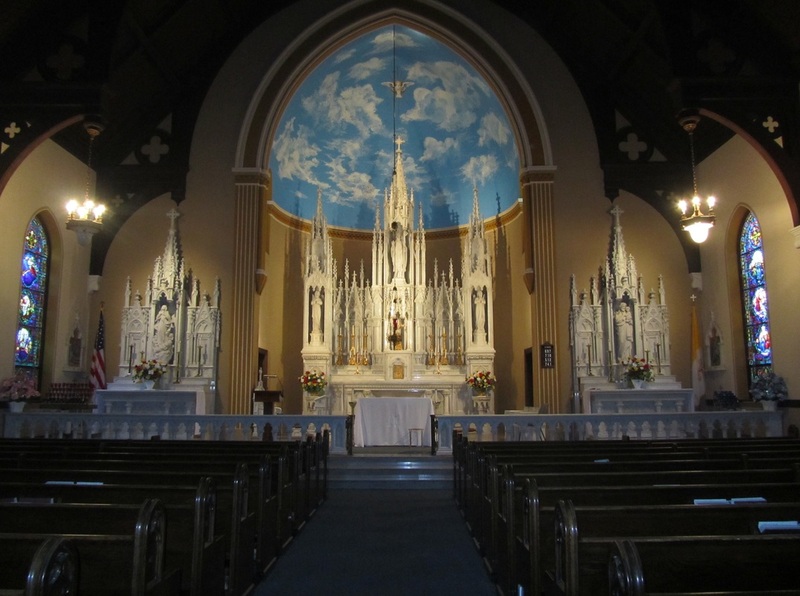 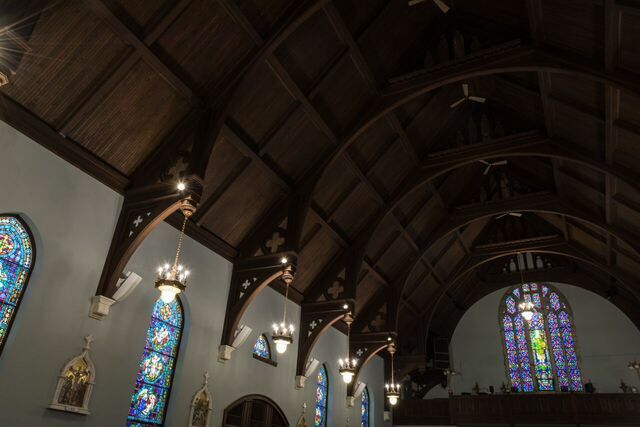 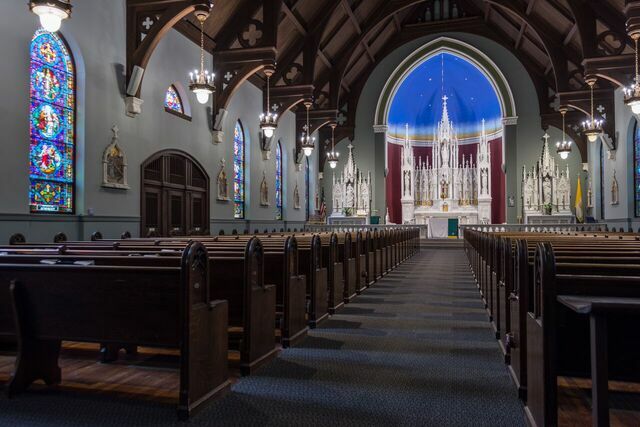 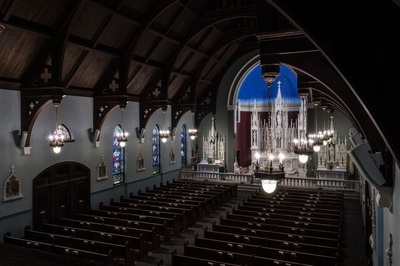 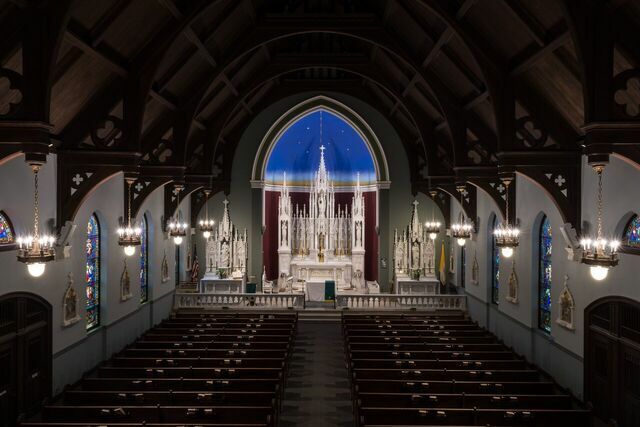 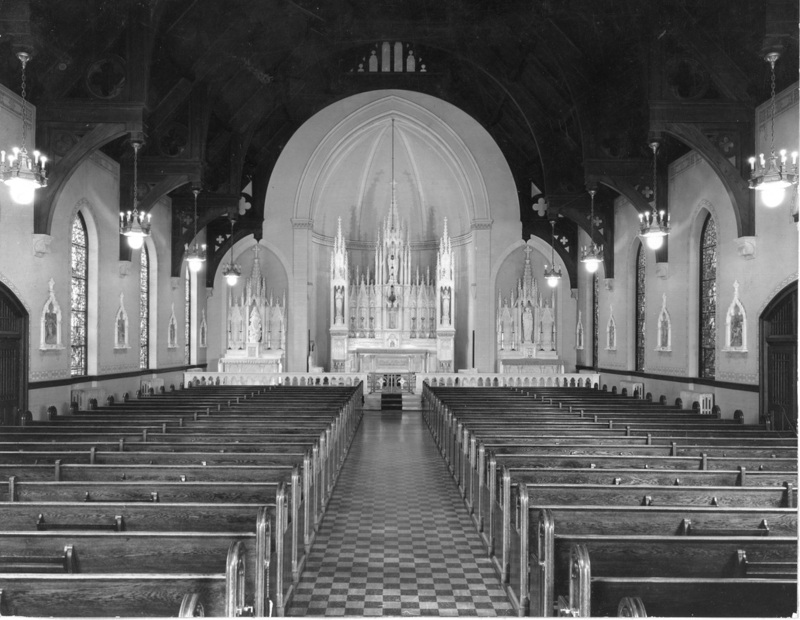 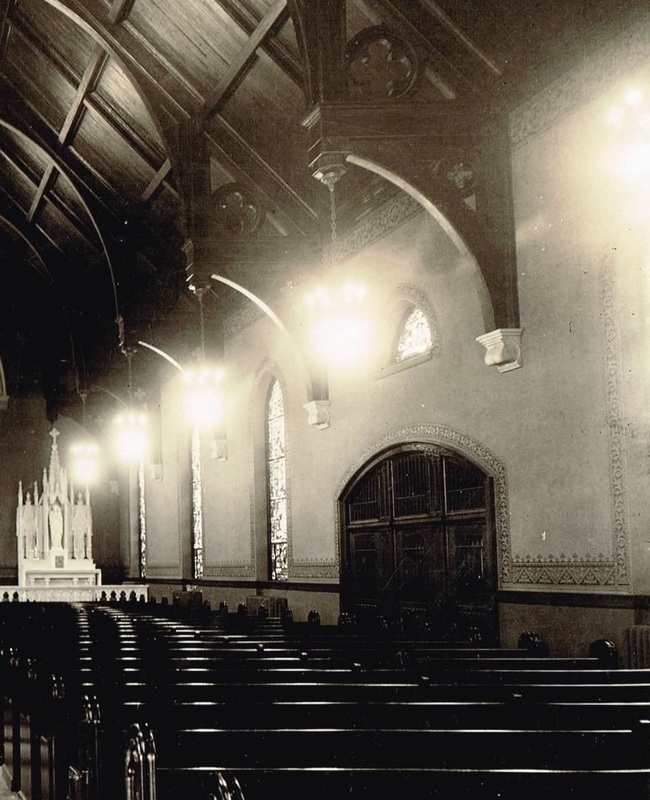 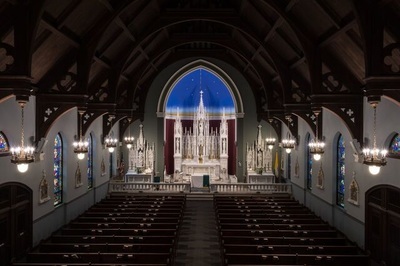 Noted Omaha architect Harry Lawrie designed both the 3rd St. Patrick Church and the St. Patrick convent. 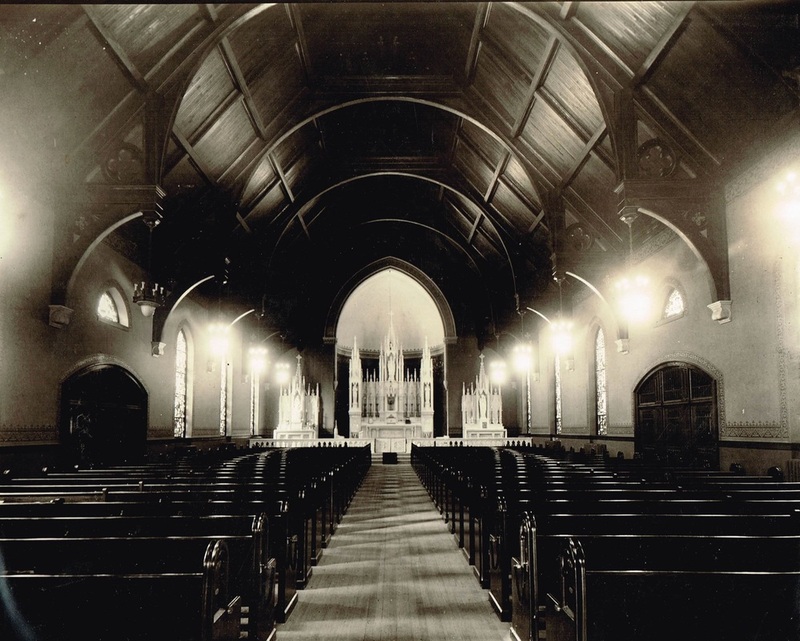 Very early picture of the 1915 church - no Stations of the Cross on the walls;first Mass October 29,1916 in church basement. 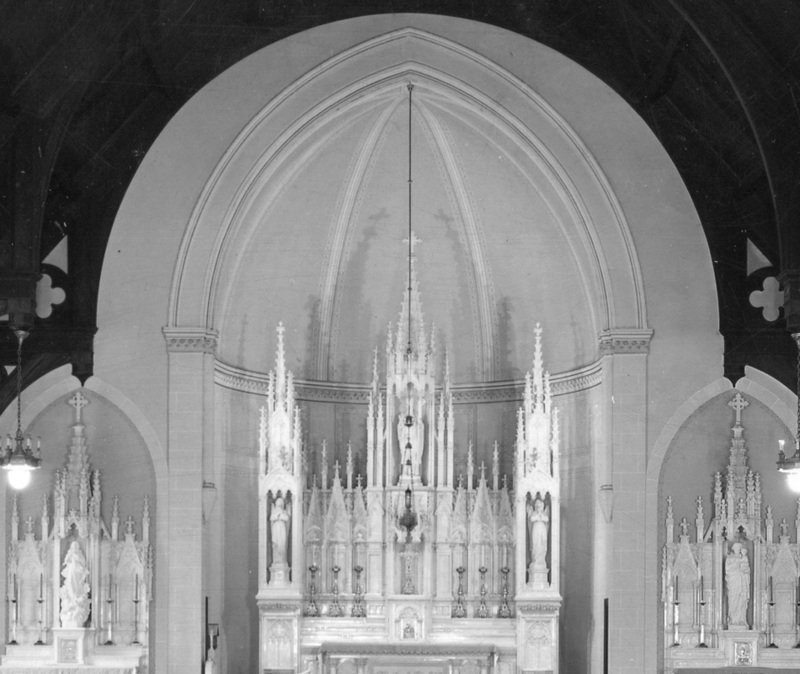 Church considered complete on March 20, 1919. 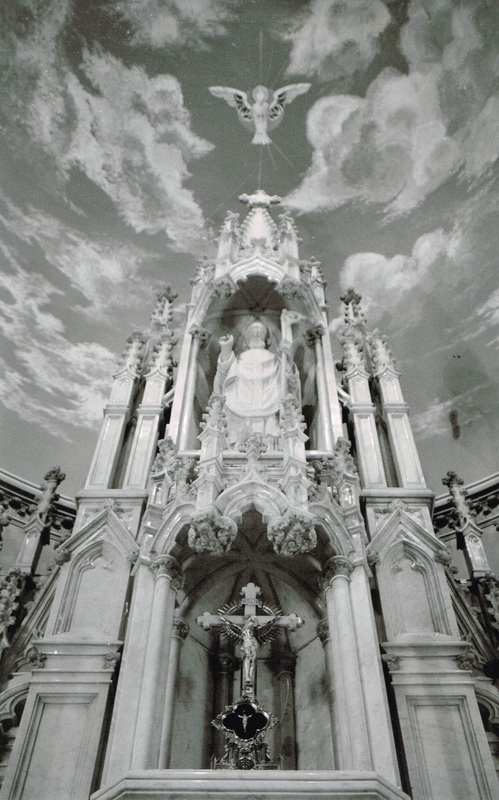 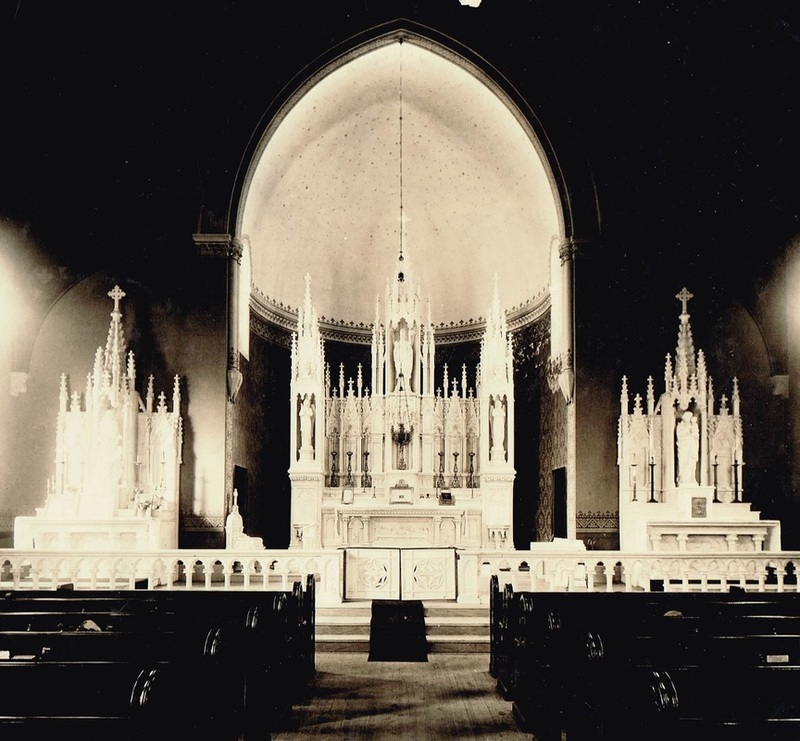 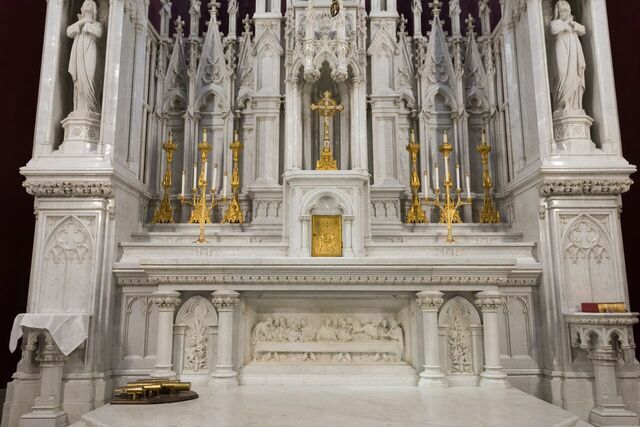 The original sagging marble altar gates were replaced by bronze gates sometime after April 1921. 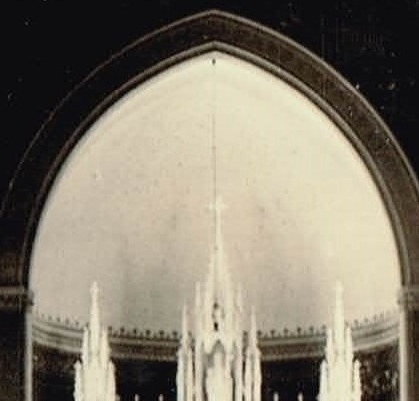 The original dome had stars on it. 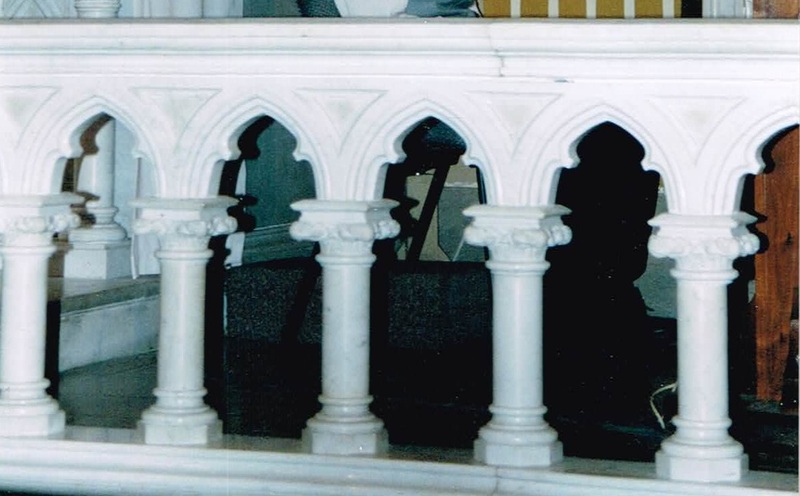 A design can be seen on the arch. 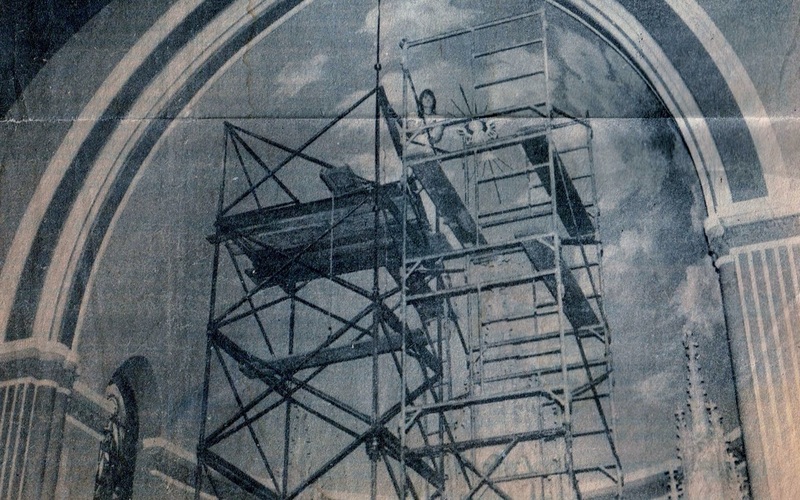 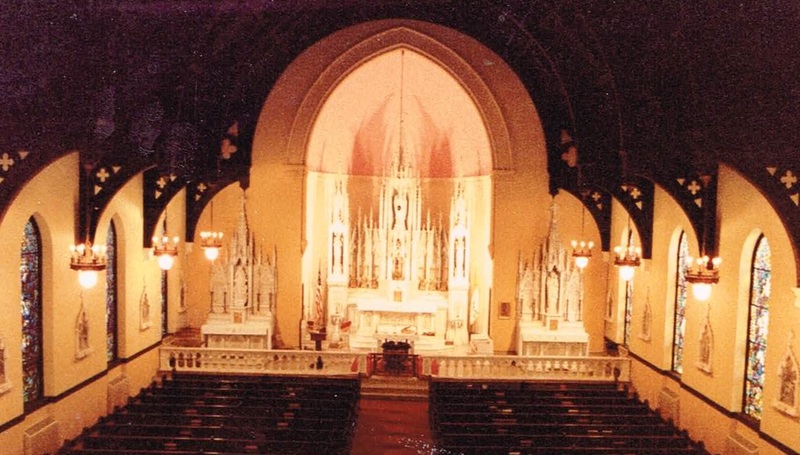 1970...The two stained glass windows in the sanctuary were boarded up and fake windows were painted around the main altar. 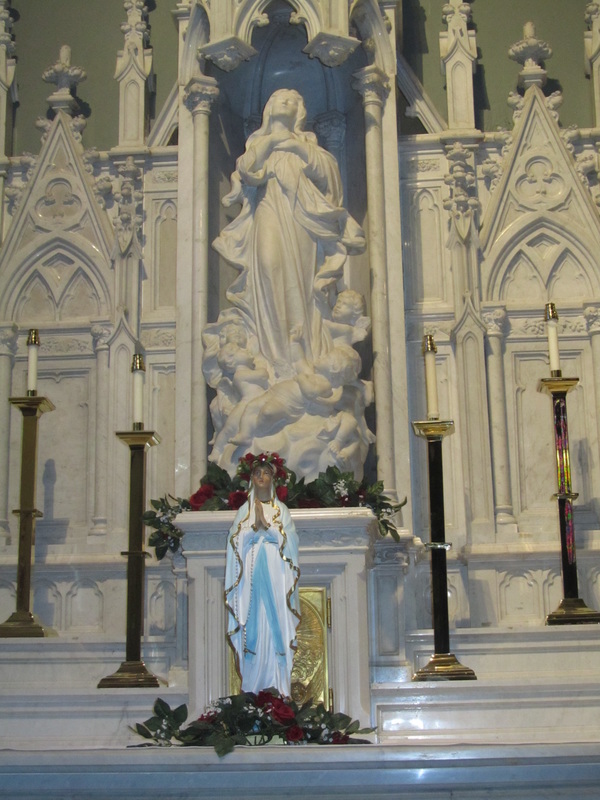 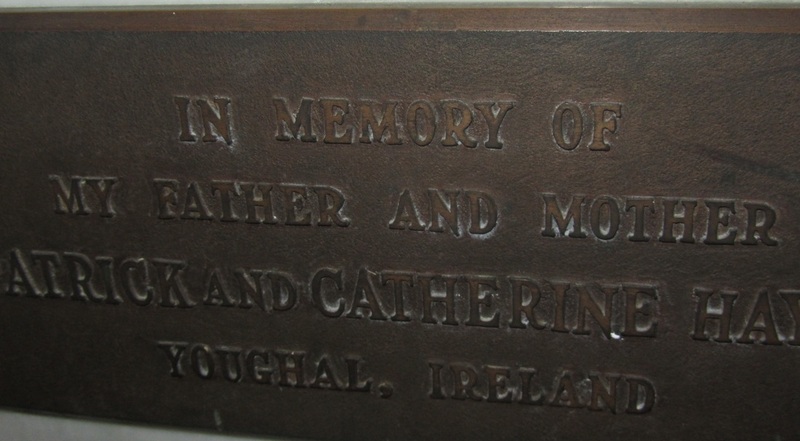 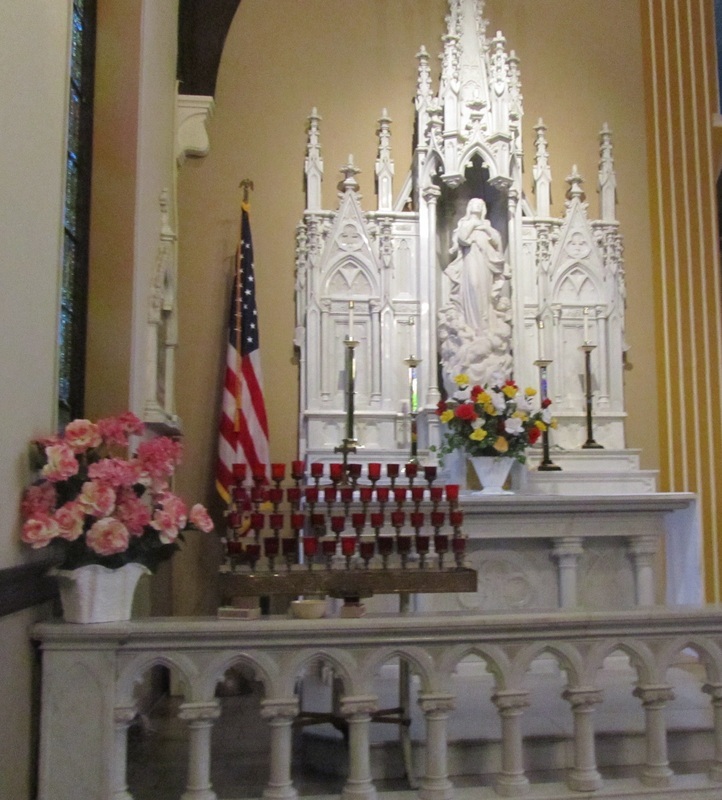 Plaque on the left side of Mary's altar says it was donated in memory of the parents of Father Hayes-Patrick and Catherine Hayes of Youghal, Ireland. 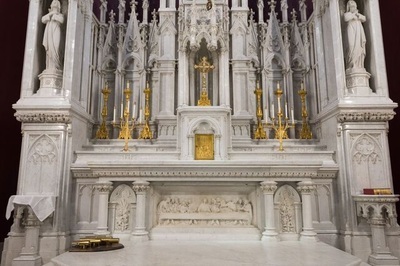 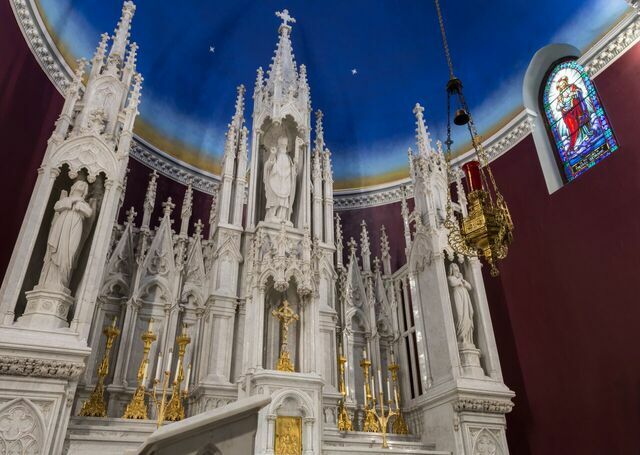 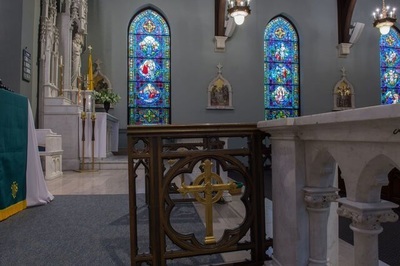 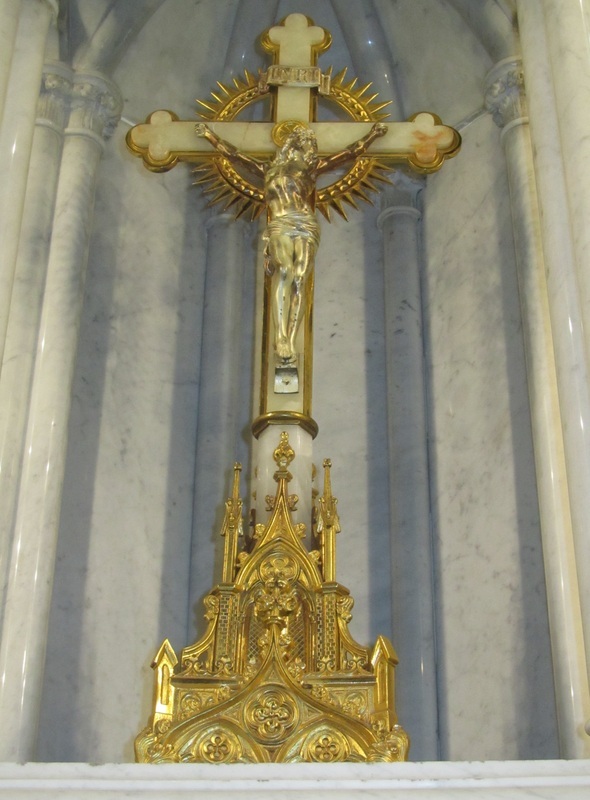 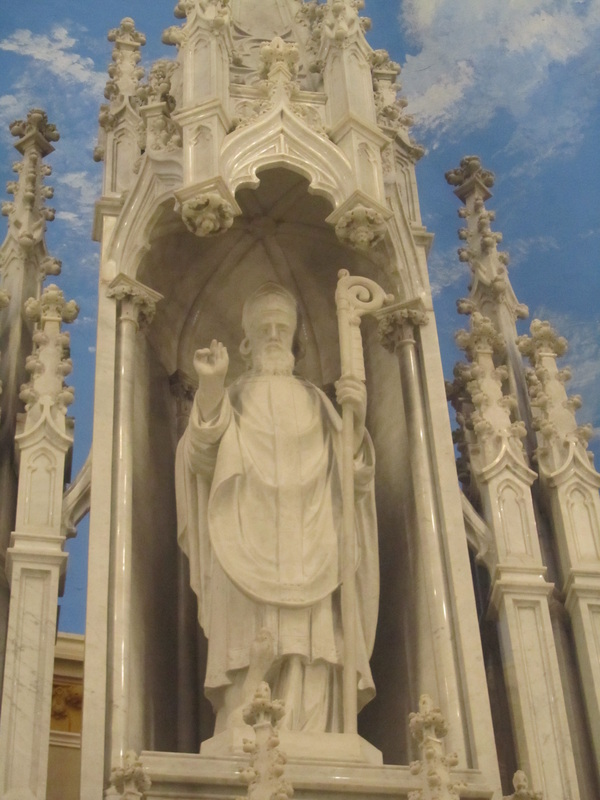 Plaque on the right side of Joseph's altar says that Father Hayes donated the altar in memory of his brothers and sisters-Joseph, David, John, Patrick, William,Catherine and Ellen.\. 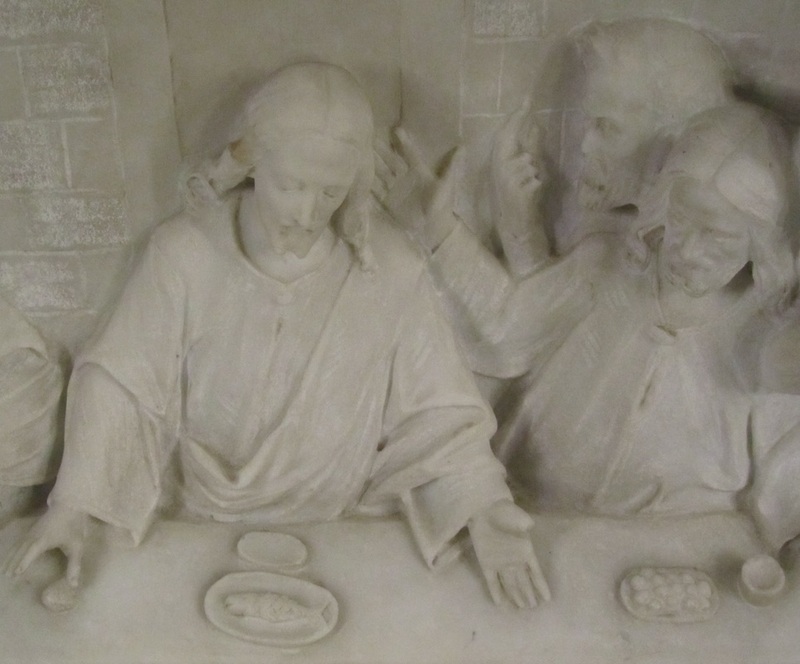 The Last Supper is very detailed right down to the fingernails on the people and scales on the fish. 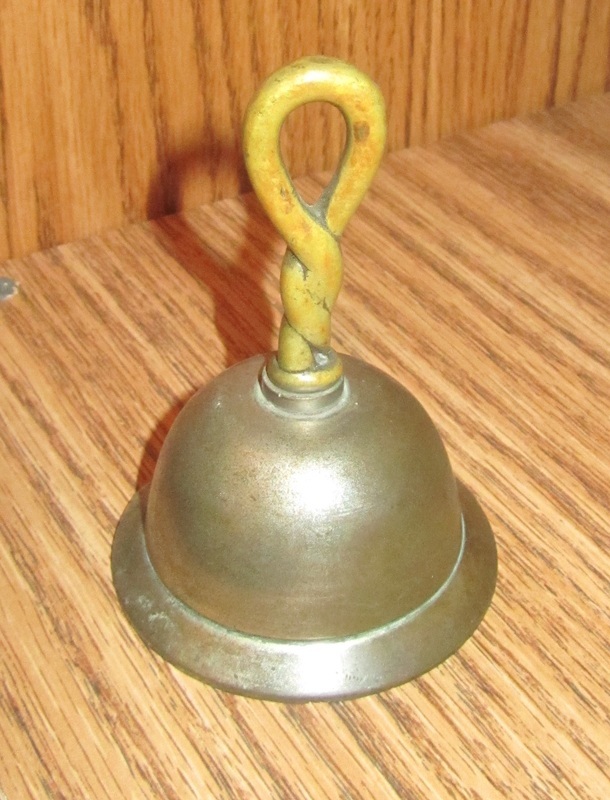 Consecration bells-former Altar Servers visiting the church cannot resist ringing the bells one more time. 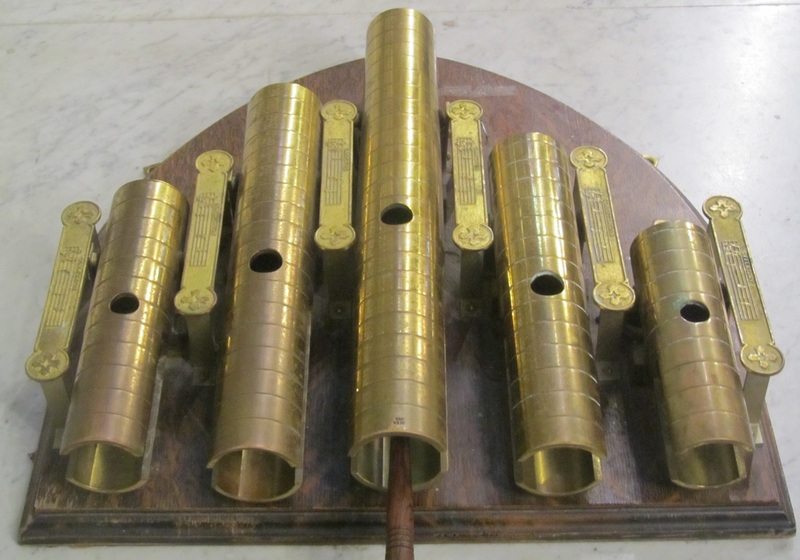 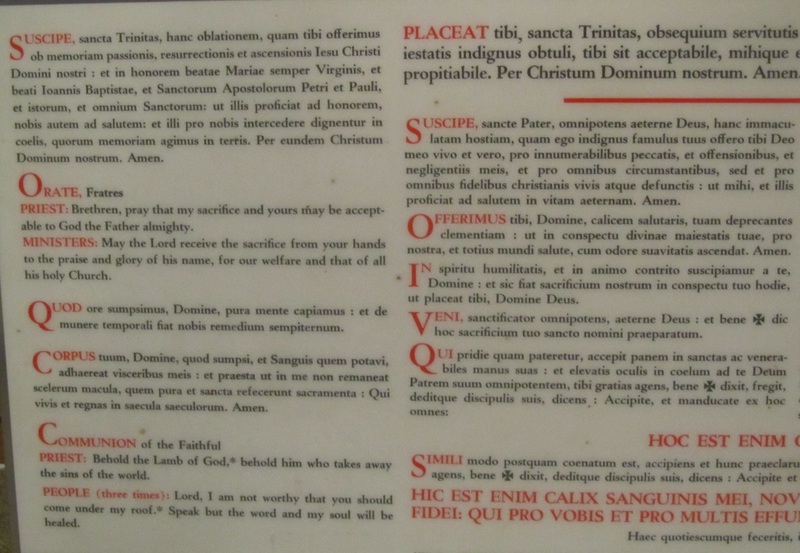 The bells are marked from left to right...Consecration, Benediction, Sanctus, Sanctus, Consecration, Offertory. 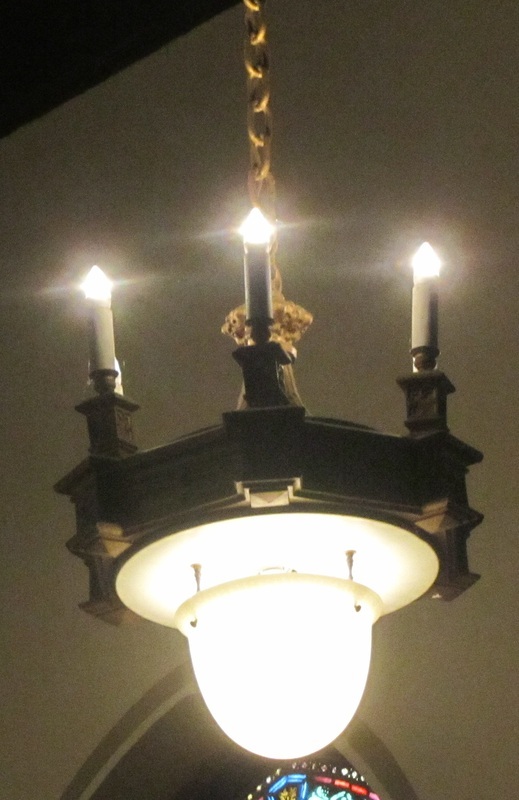 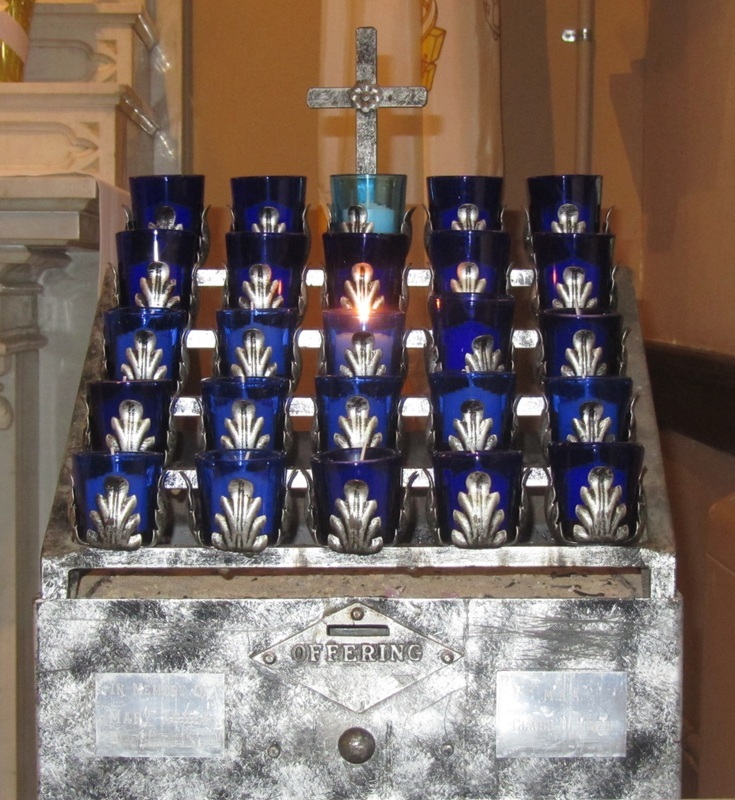 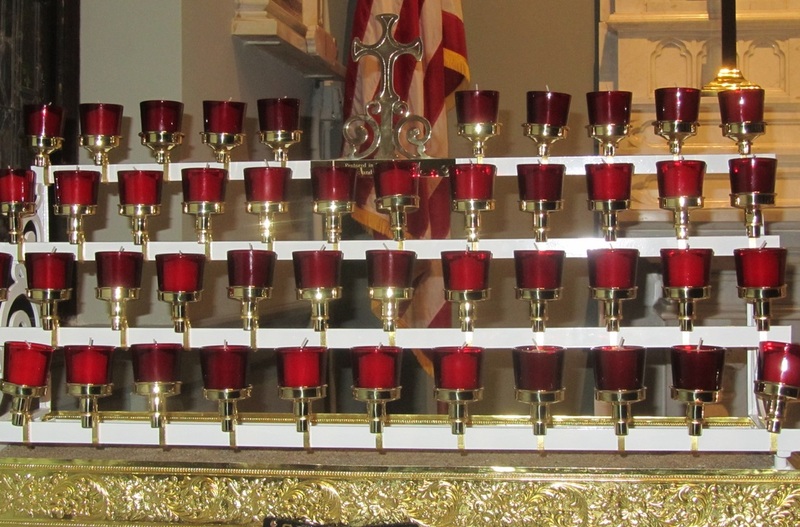 The marbelized candle holders on either side of the altar were originally black in color. 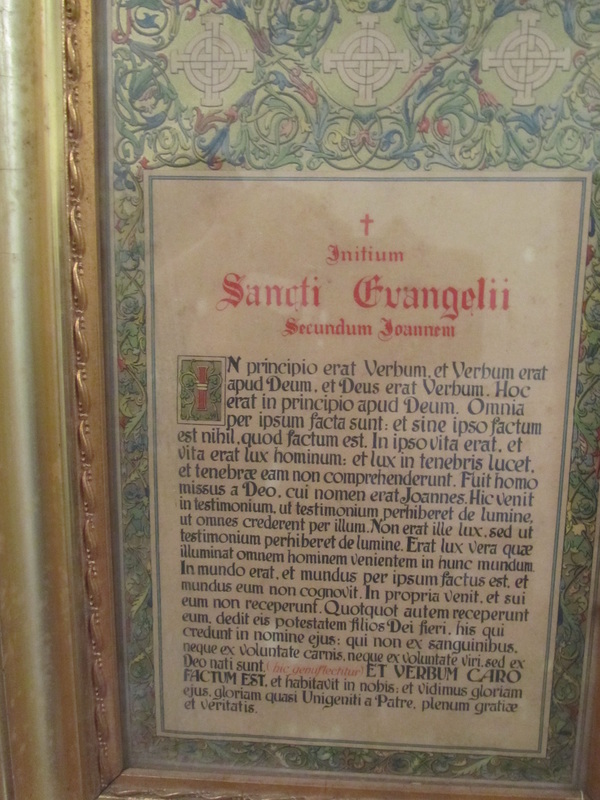 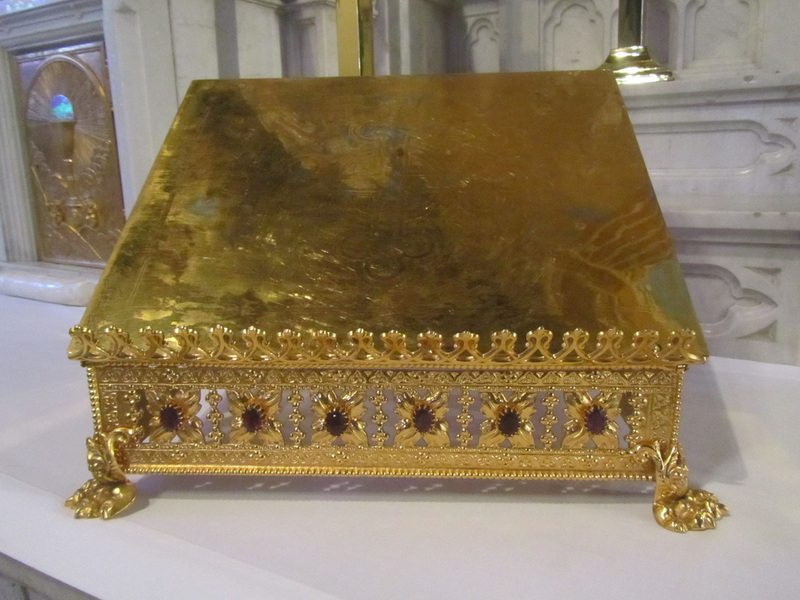 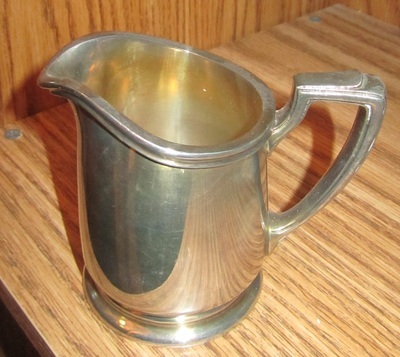 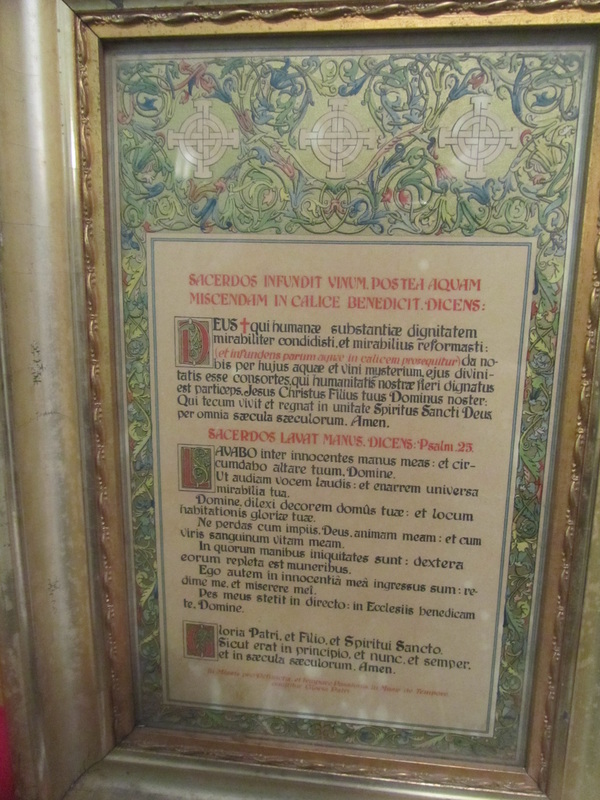 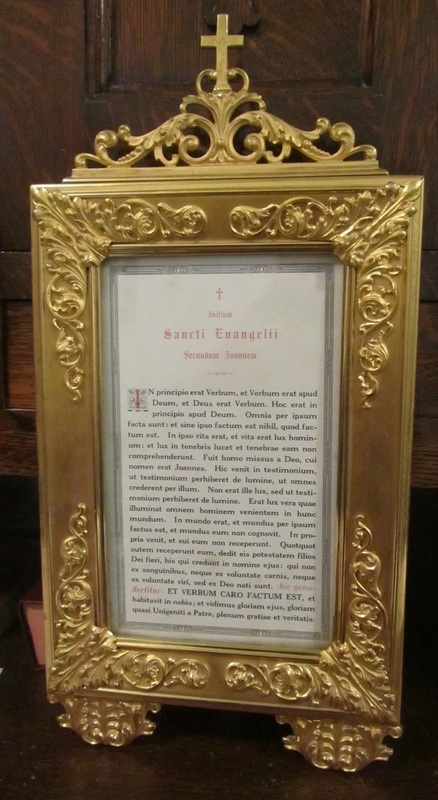 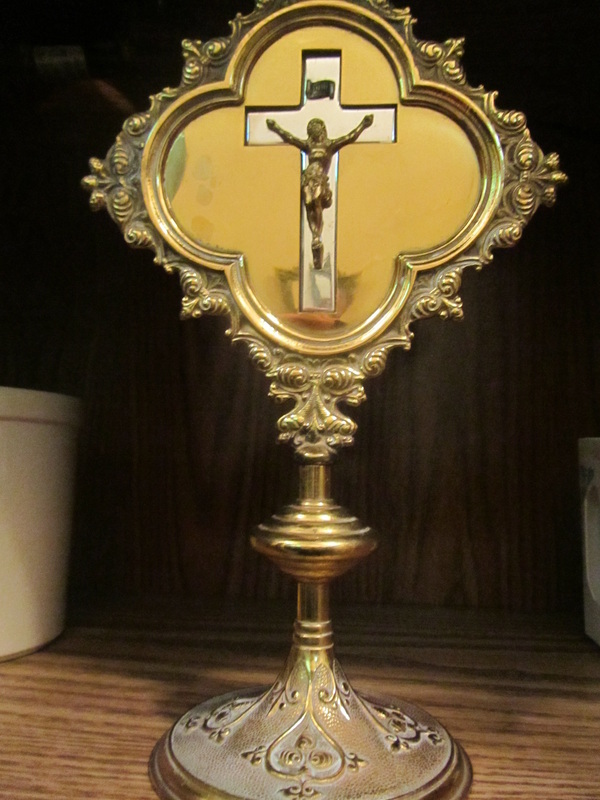 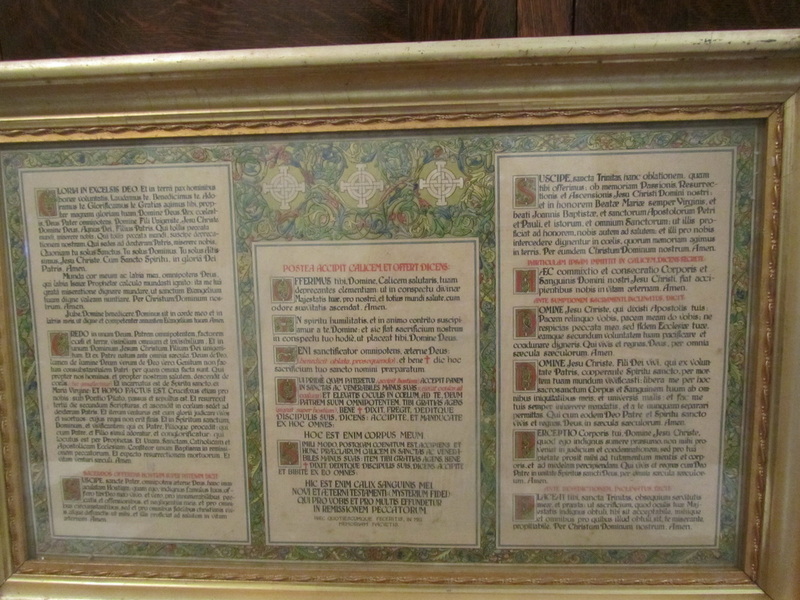 In the pre-Vatican church, six of these were placed by the casket at a funeral. 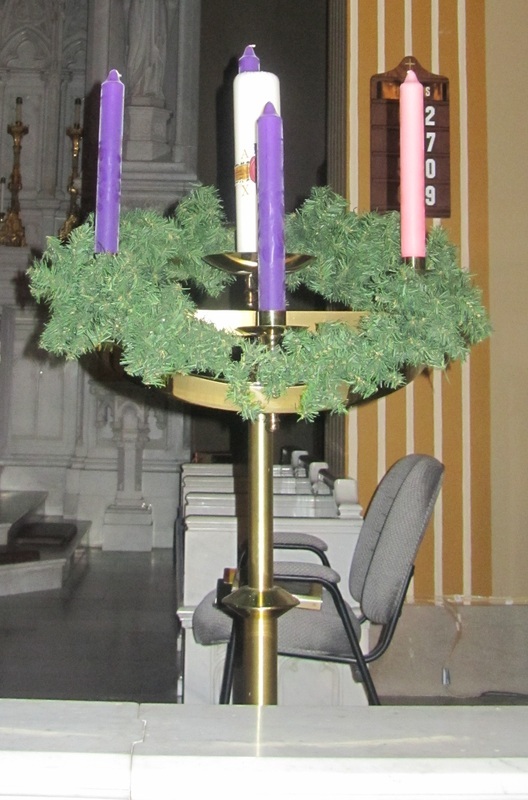 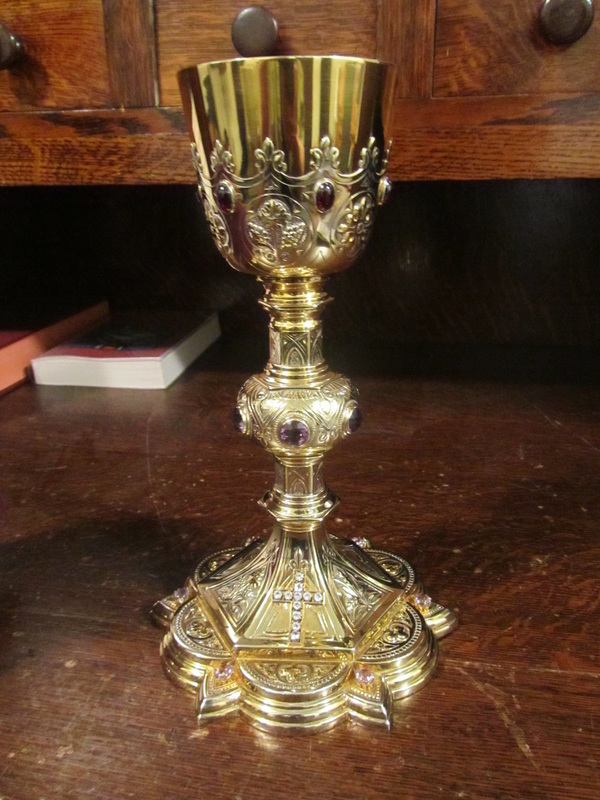 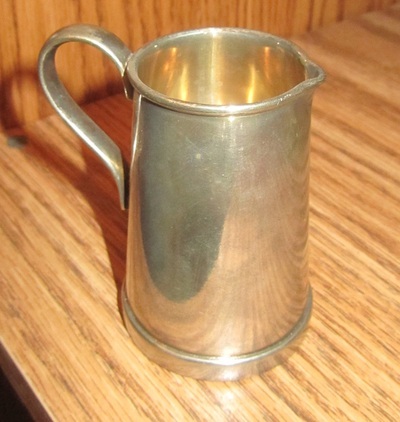 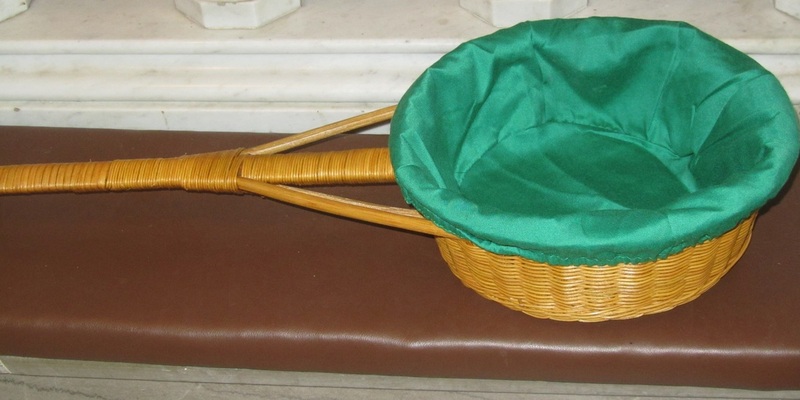 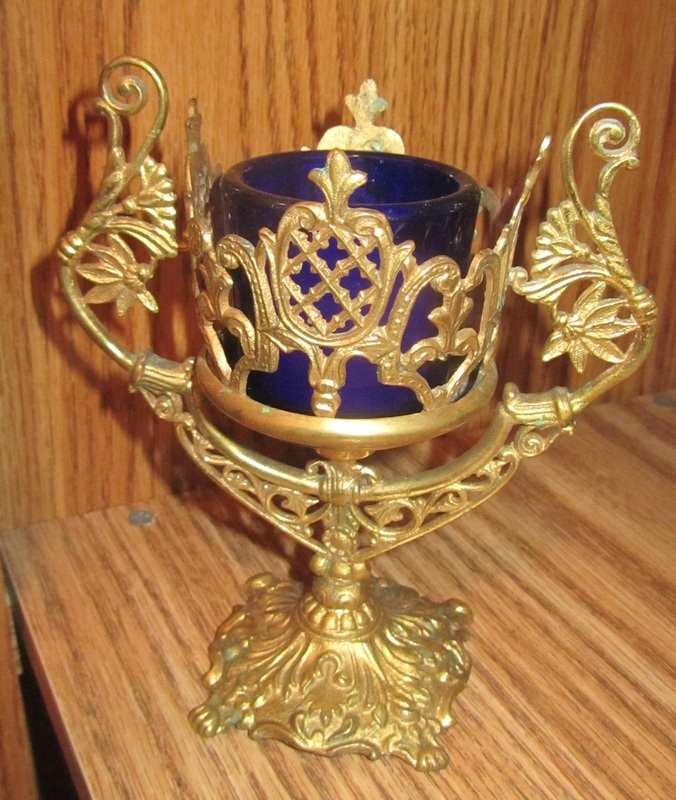 Two of our holders are also used at St. Mary Church-Red Oak. 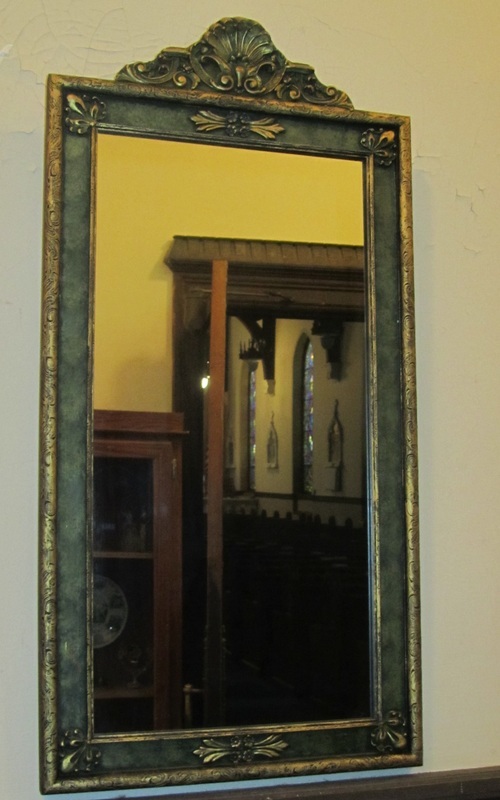 Two holders in storage are the original black color. 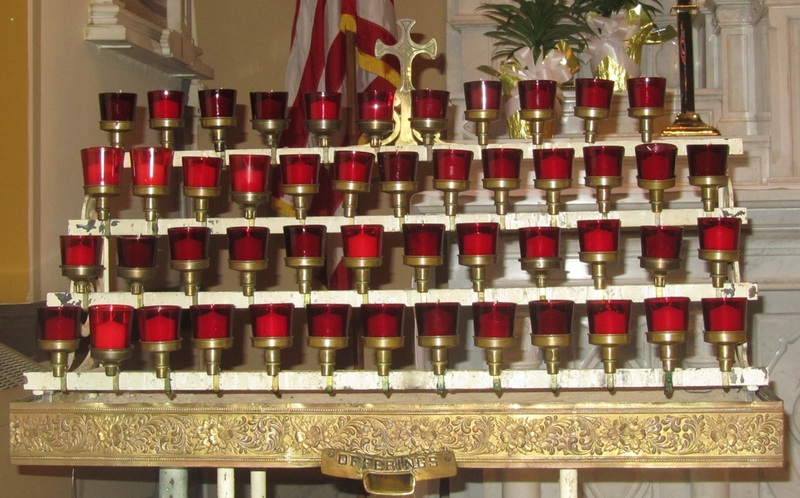 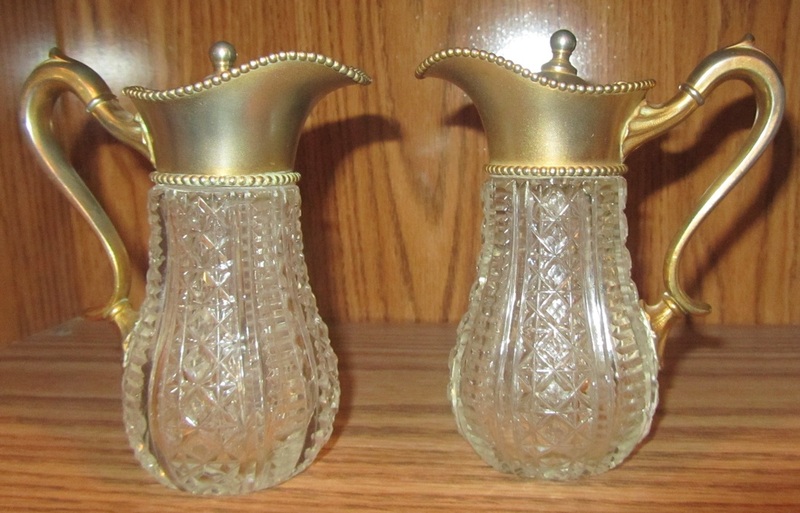 Present day candlesticks blessed September 14, 2014. 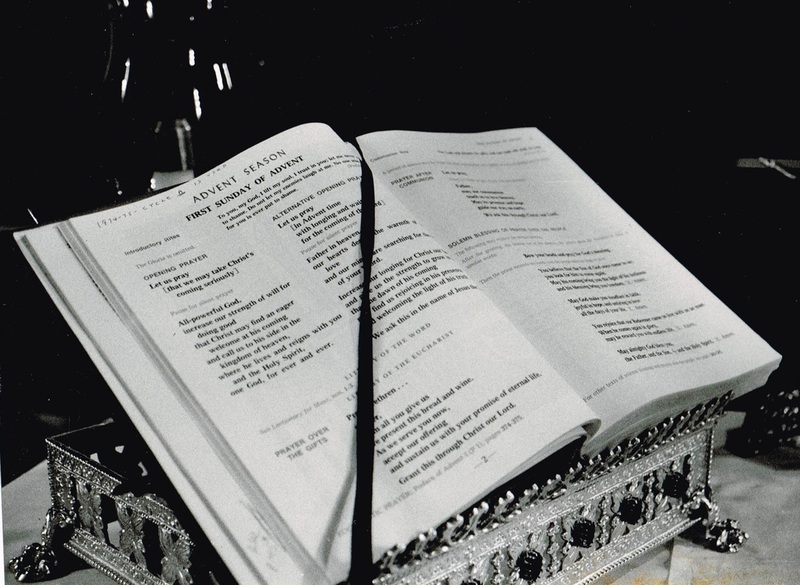 Bookstand will become part of a new Reading Table. 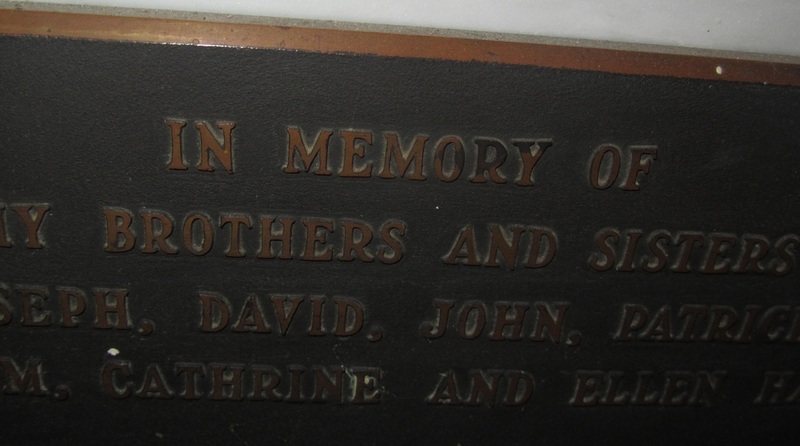 Donated in memory of Mary McGargill by her classmates. 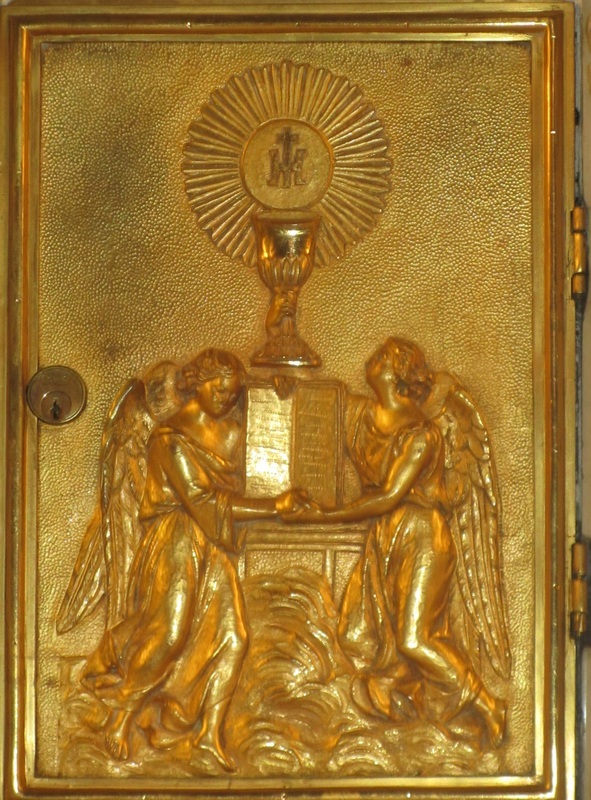 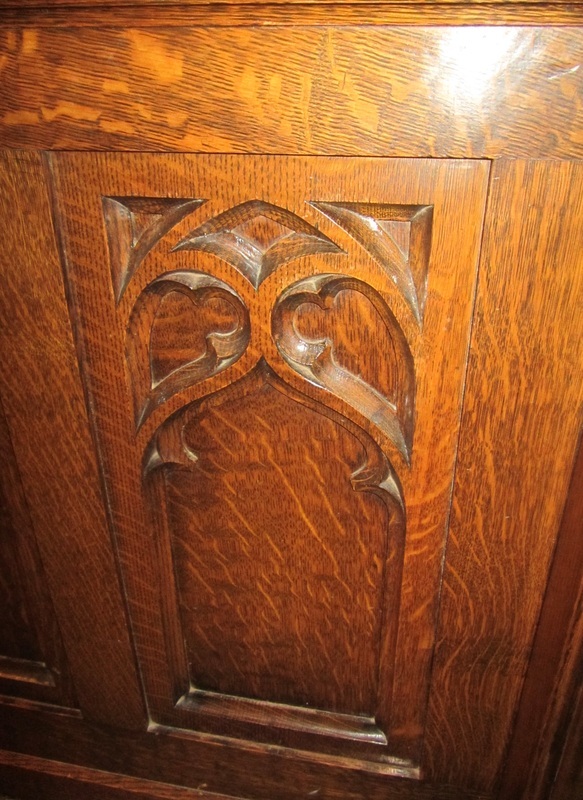 The oldest votive stand in the church was donated by the Altar Society in 1927. 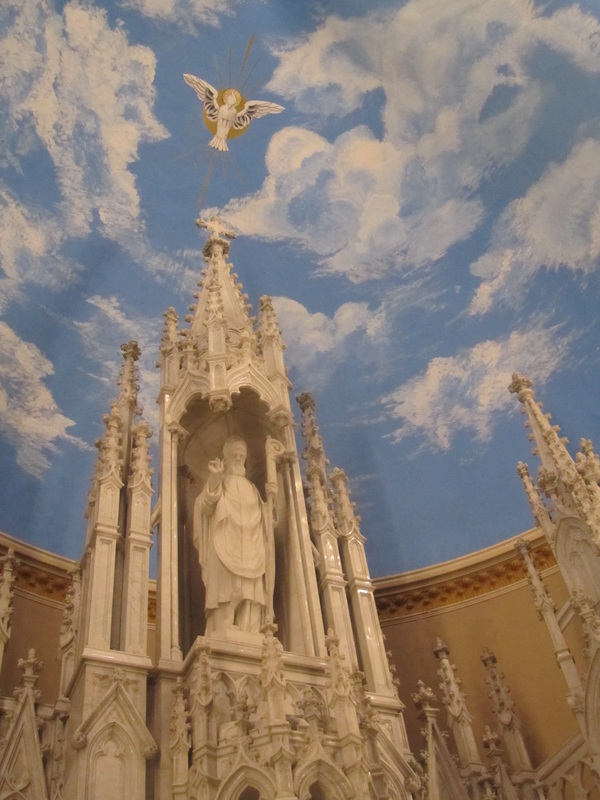 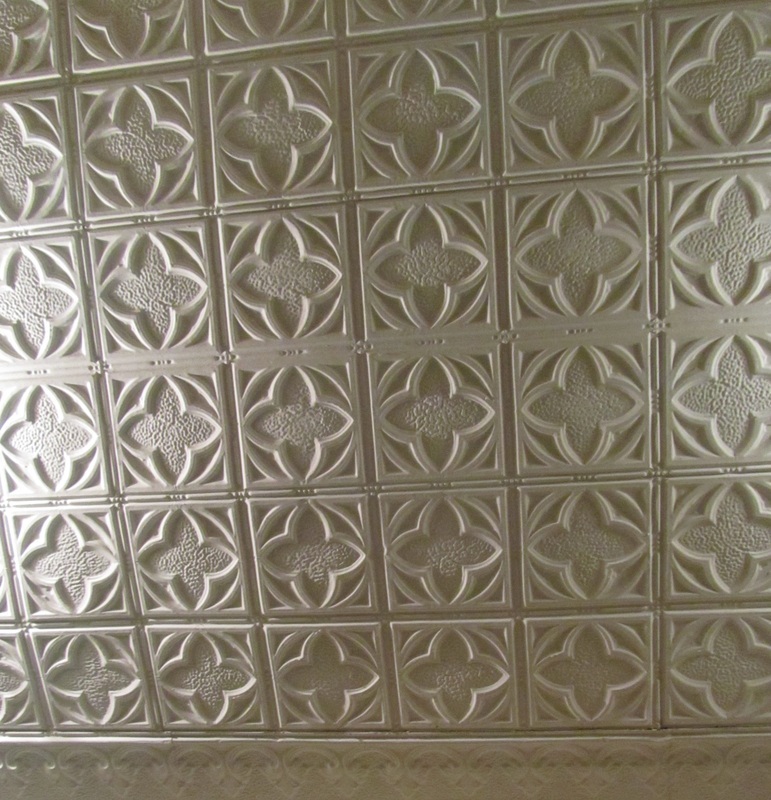 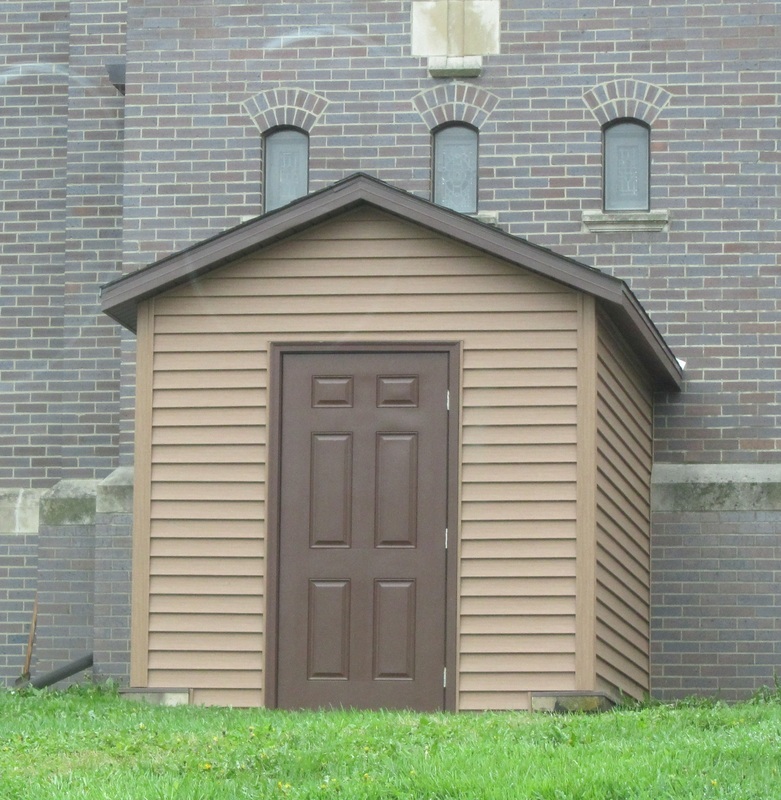 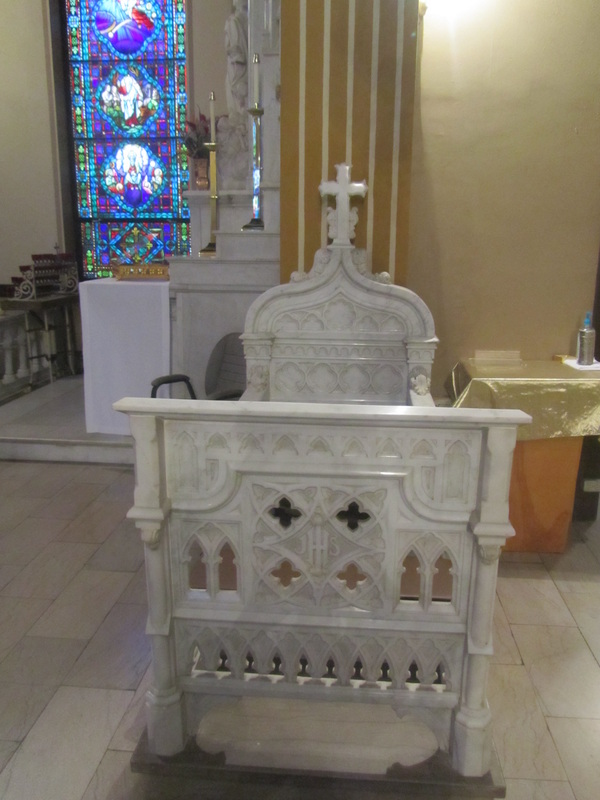 It was restored and returned in memory of Frank & Monica O'Connor by their family on June 12, 2015. 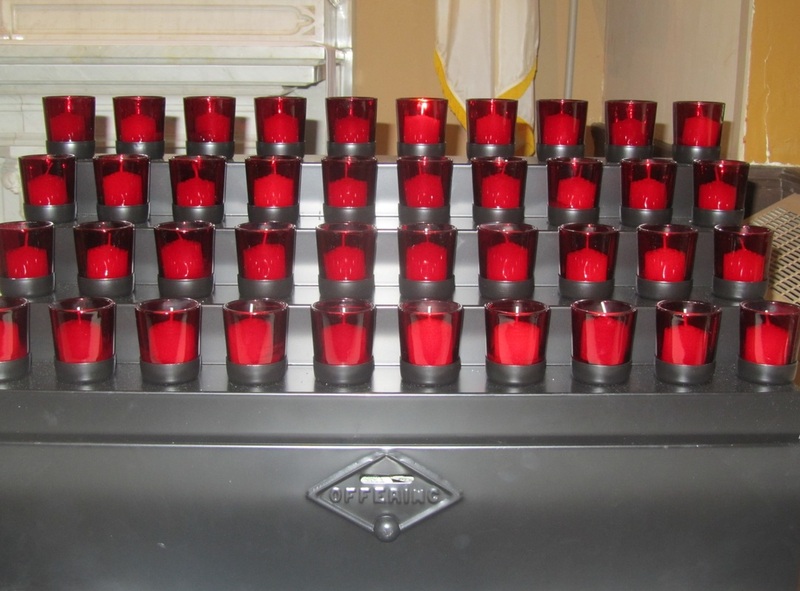 Blessed May 4, 2014 Donated in memory of Fannie and Dee Martin by the Tim Martin Family. 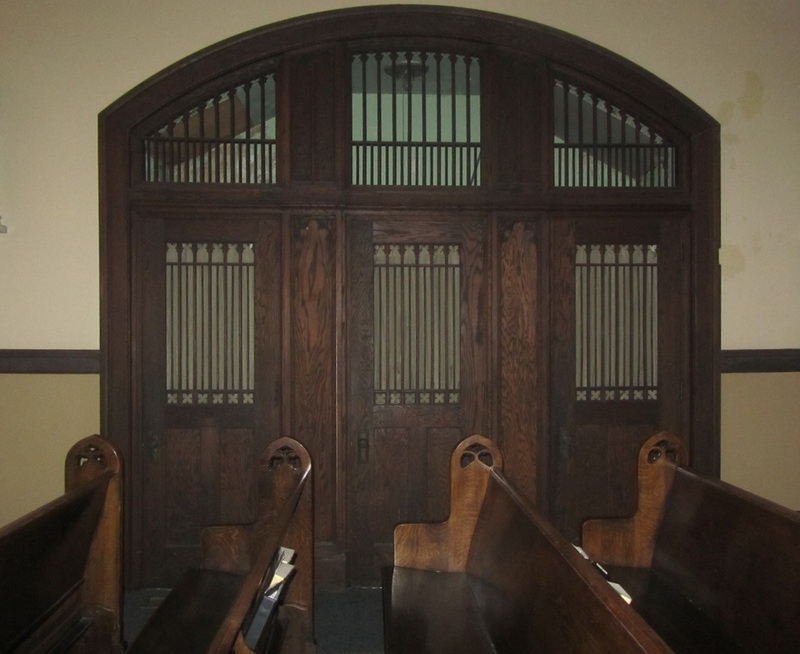 The church was wired for electricity before electricity came to Imogene. 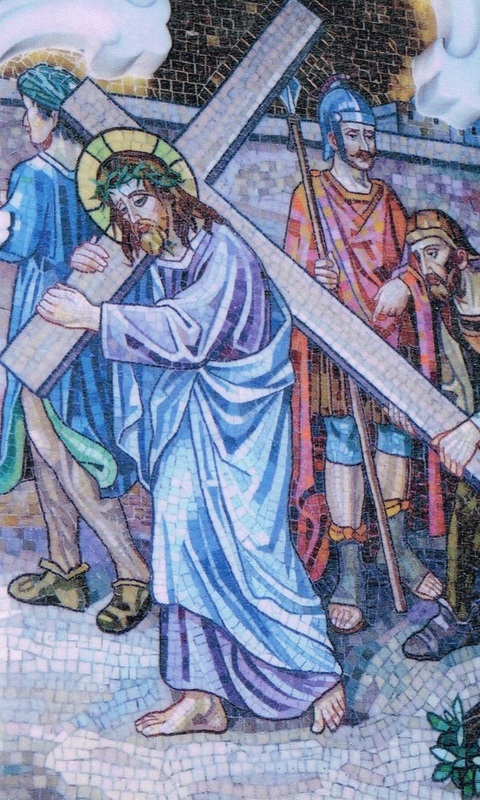 White cararra marble and mosaic stations of the cross line the church walls; designer of the mosaic pictures was O. S. Kimberly from NY who studied with Tiffany. 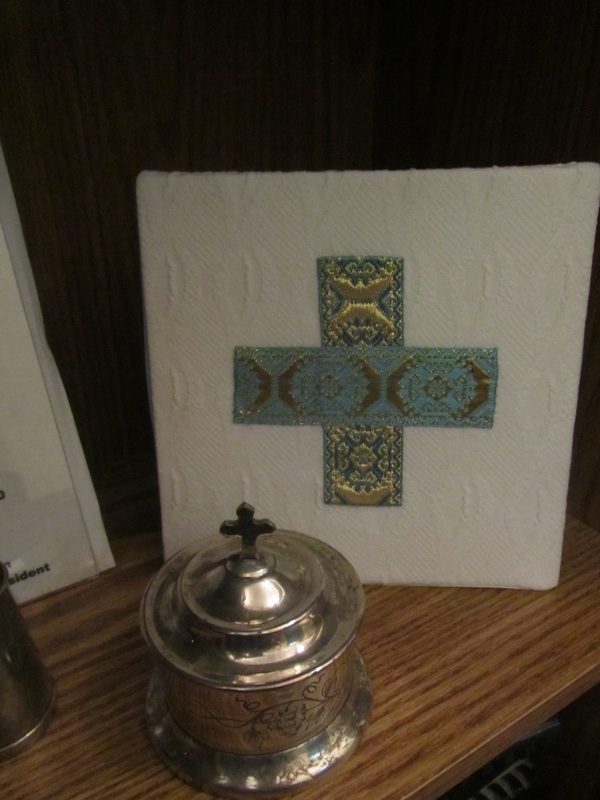 Pictures of our Stations were used in the booklet "Stations of Contradiction" published by the Daughters of St. Paul. 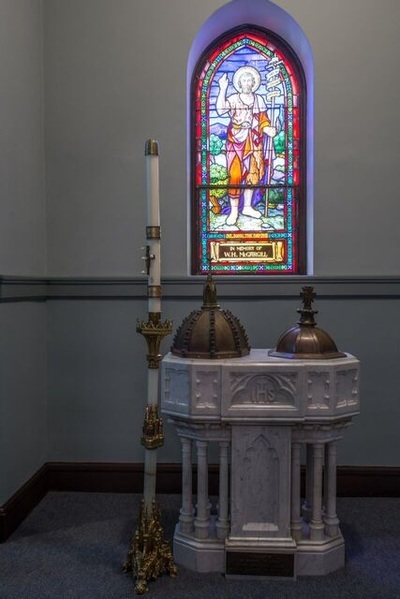 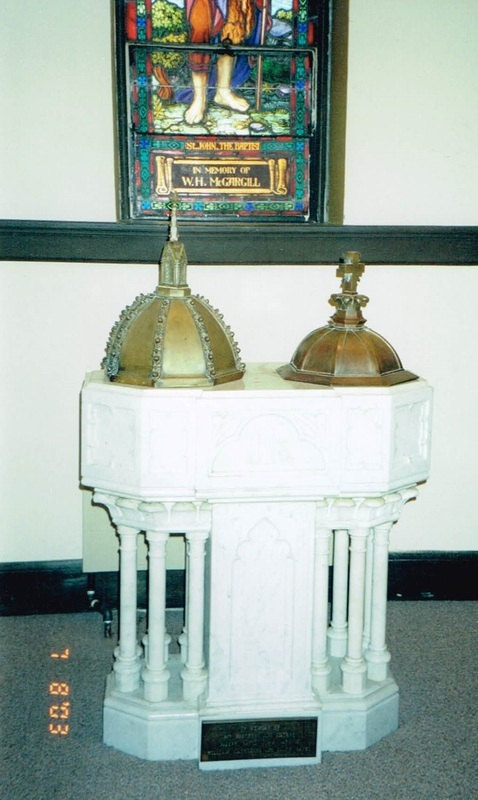 Baptismal Font donated by Father Hayes in memory of his brothers and sisters-Joseph, David, John, Patrick, William, Katharine and Ellen Hayes. 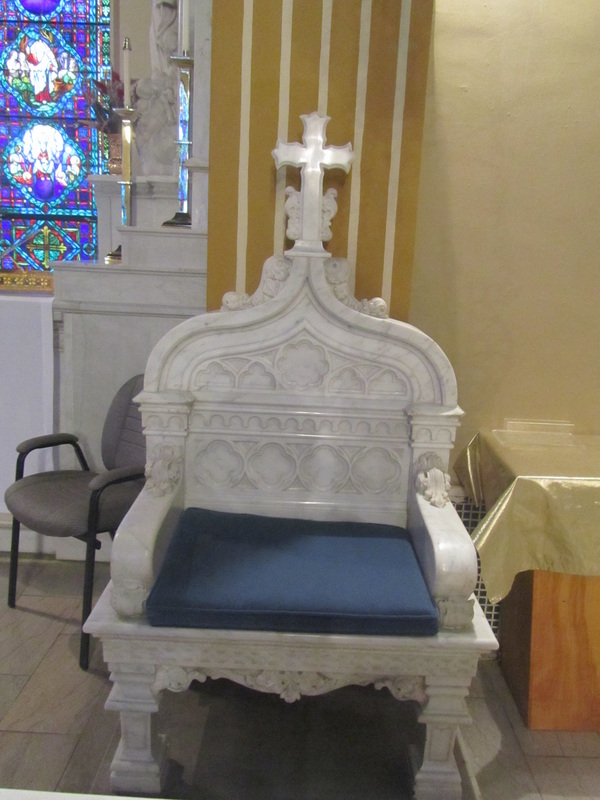 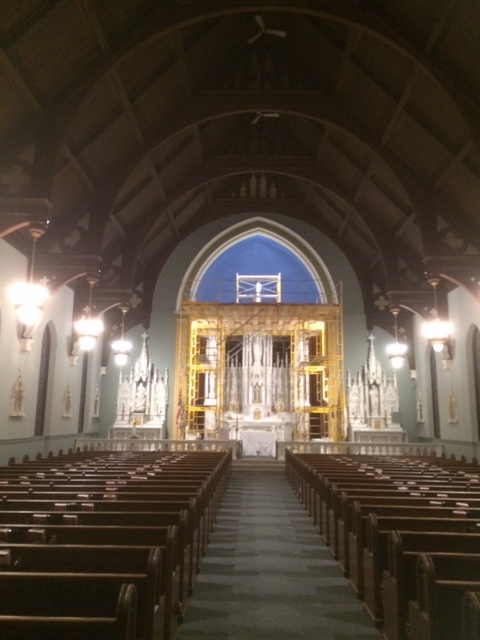 The Cathedral is the only other church in the diocese with a Bishop's Chair. 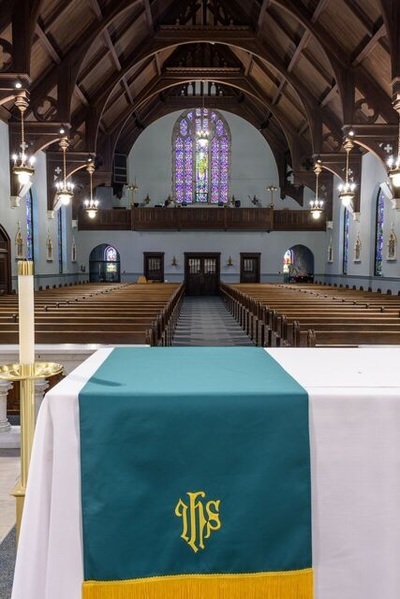 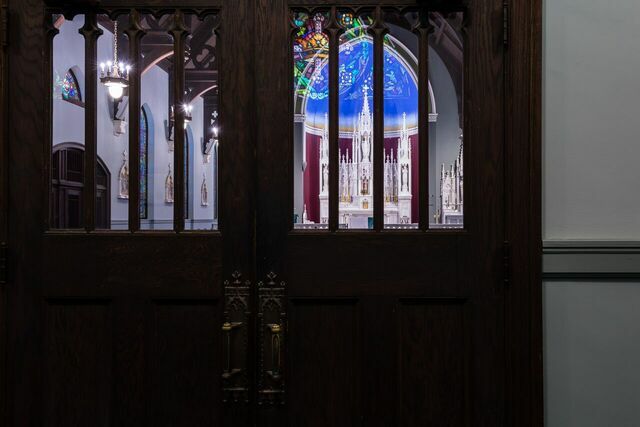 We are one of only three churches in the diocese that has retained the communion rail. 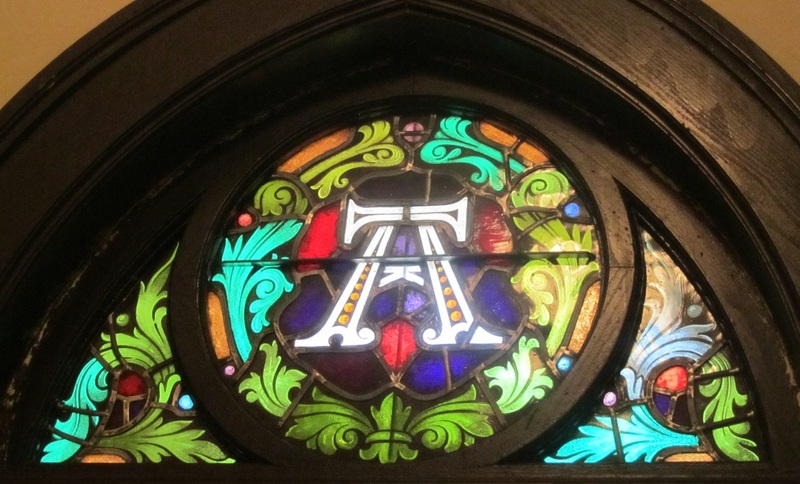 Alpha window over SE door of church. 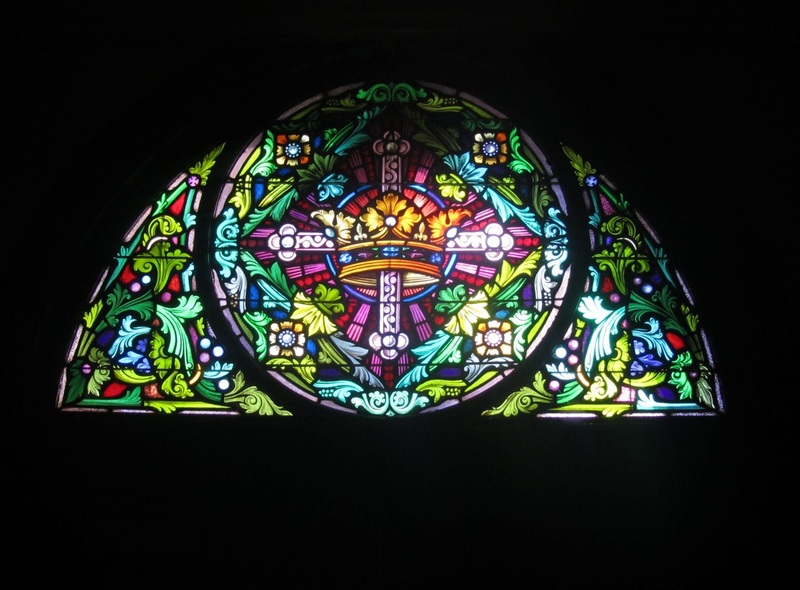 Window over the entrance of the church. 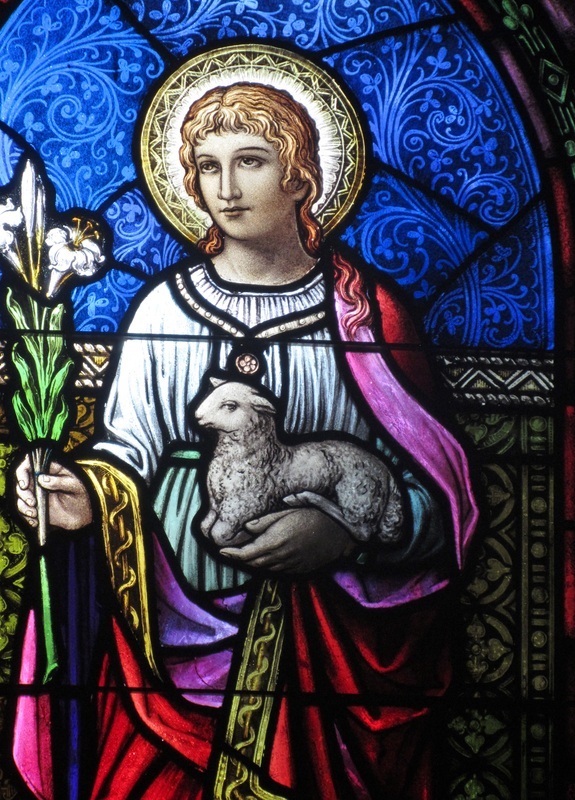 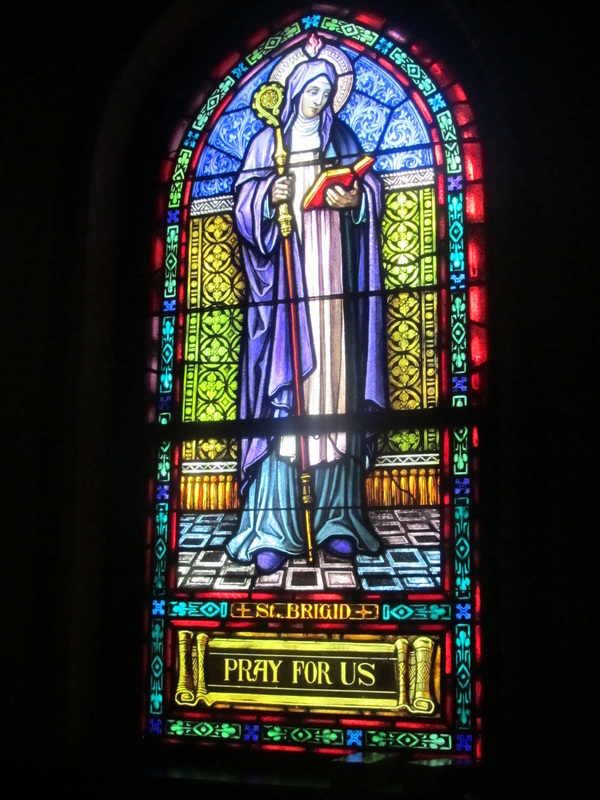 St. Agnes window donated by the Teachers-located to the south of the Pieta statue...SW corner of the church. 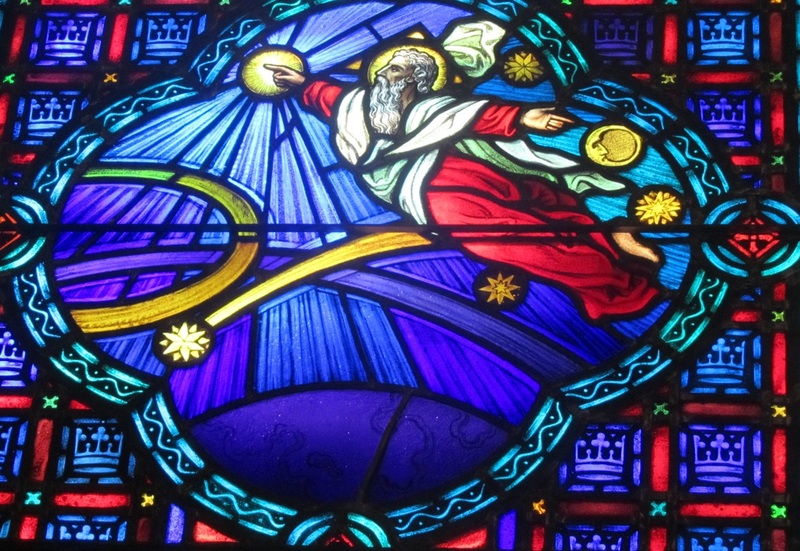 The creation panel is said to be more futuristic in design compared to all the other more traditional panels. 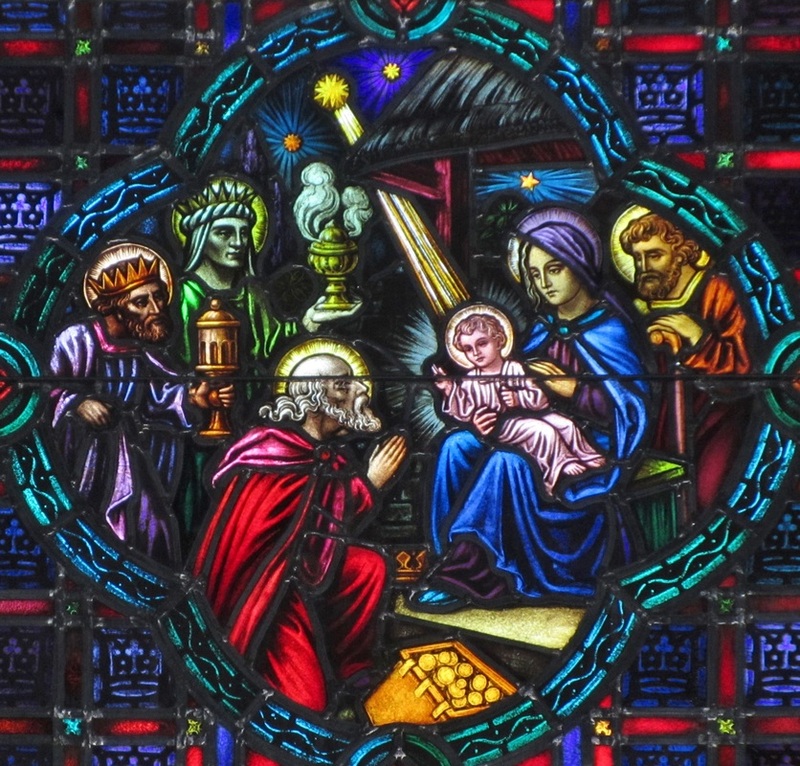 Note that God the Father always has a triangular shape behind His head. 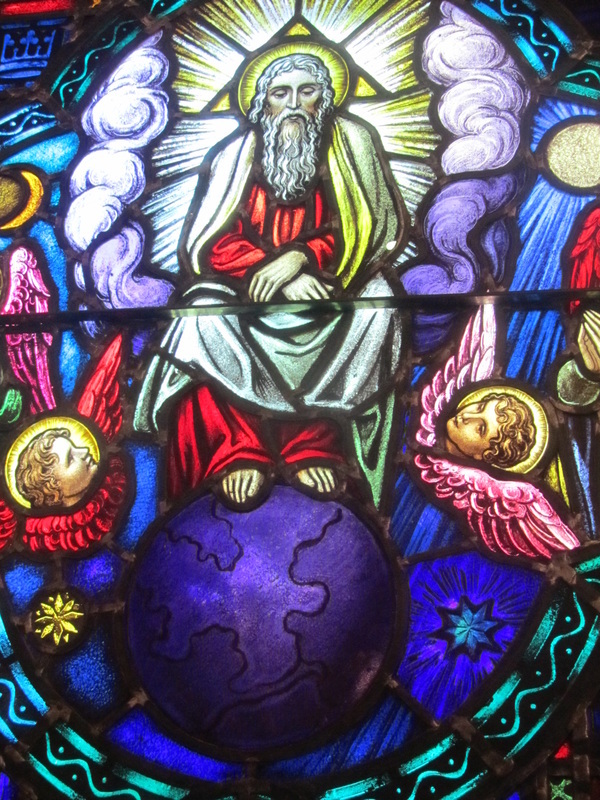 God the Father rests after His creation is completed. 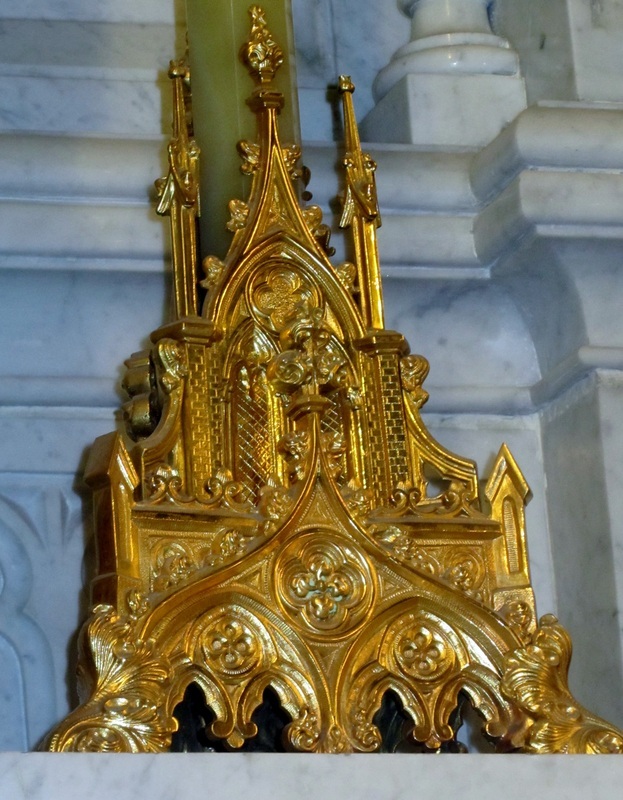 The seven apples in this panel stand for the seven capital sins. 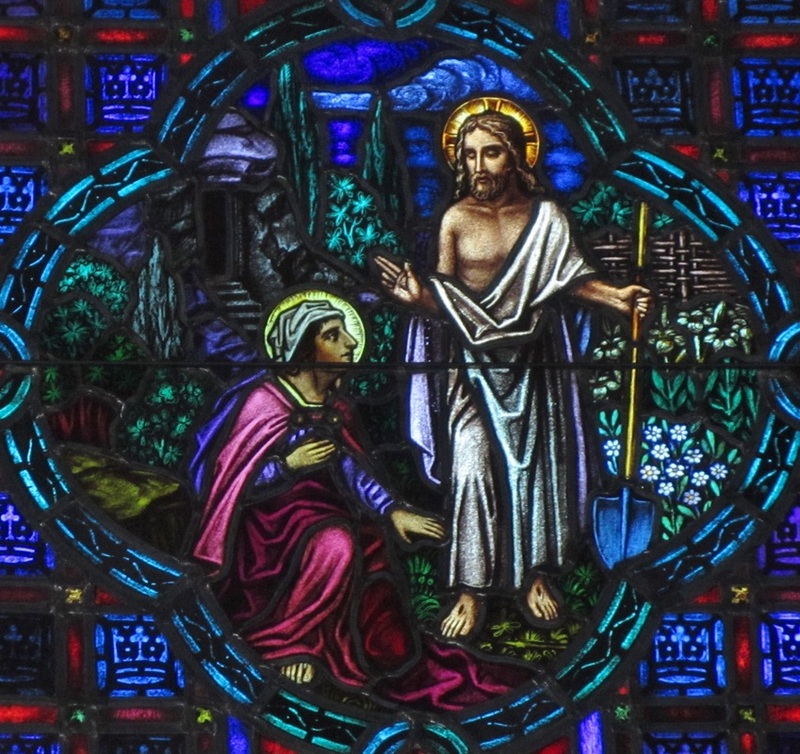 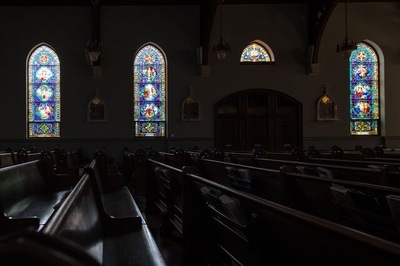 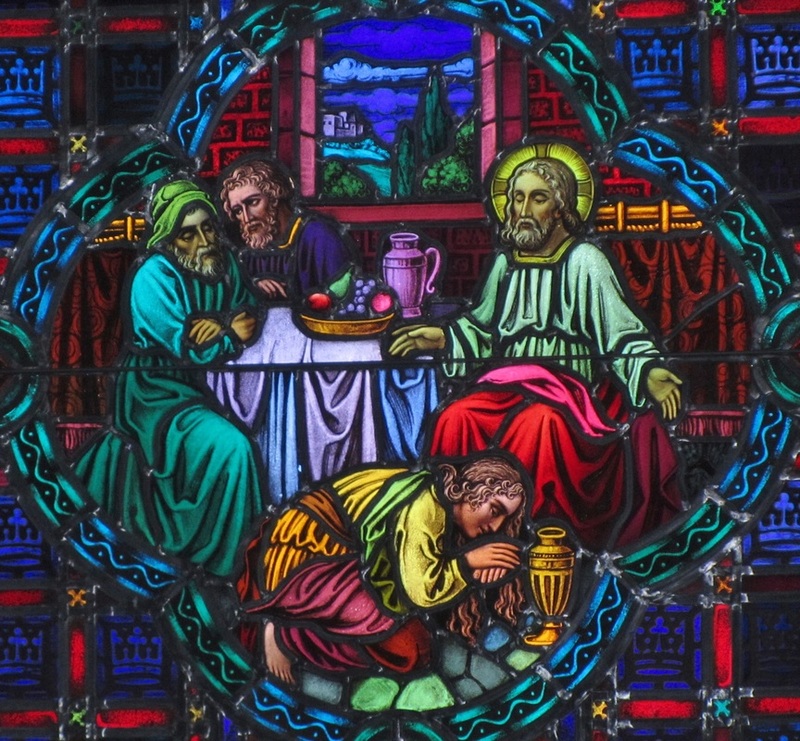 Stained glass windows were first put in churches to help teach the faith. 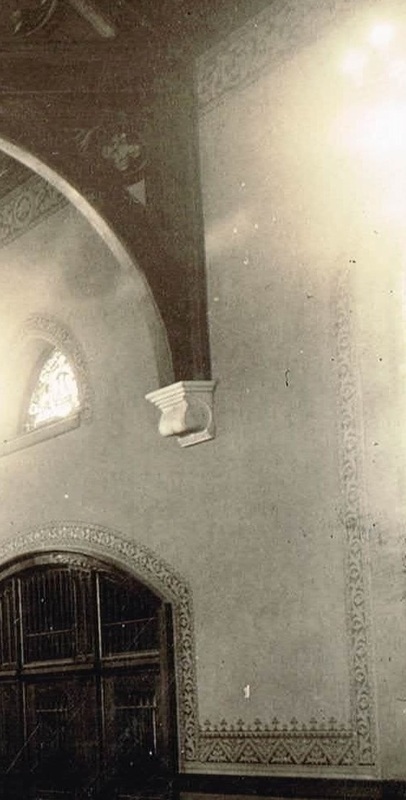 The majority of people could not read. 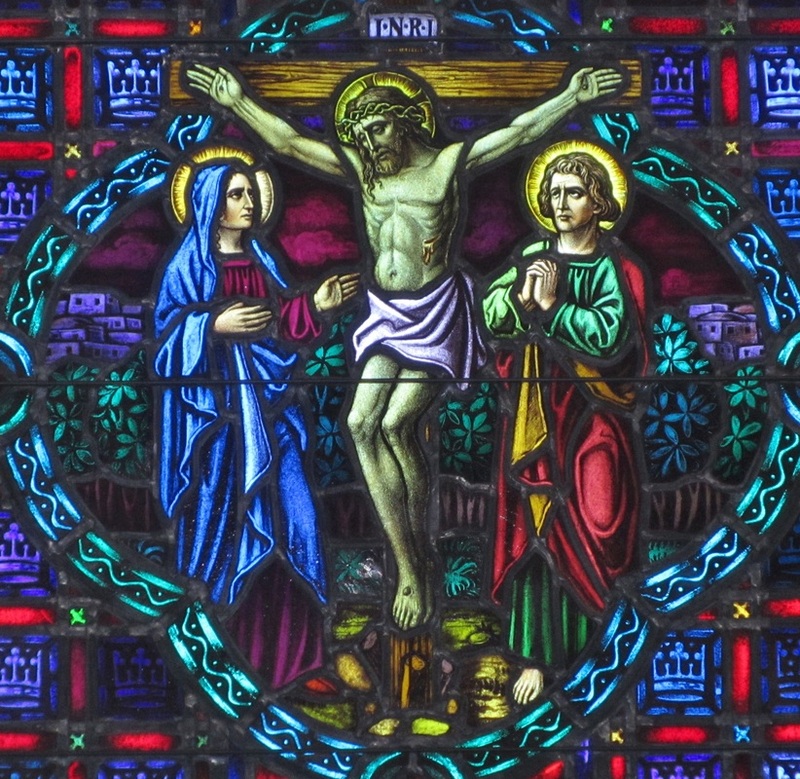 They could look at a window and listen to the teachings that went with the window. 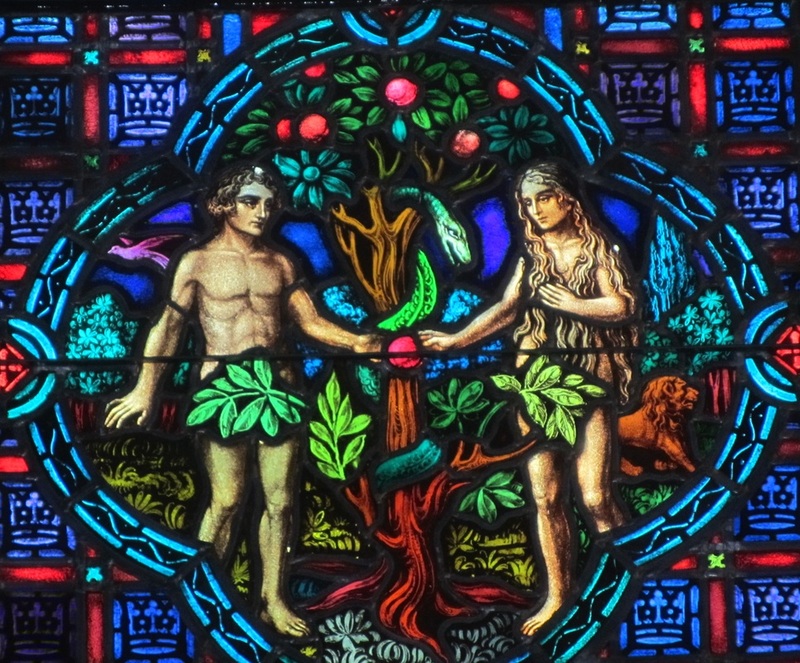 Beginning at the NW corner of the church and ending at the NE corner of the church, the stories tell of creation, the fall of man, the life of Jesus and the redemption of mankind. 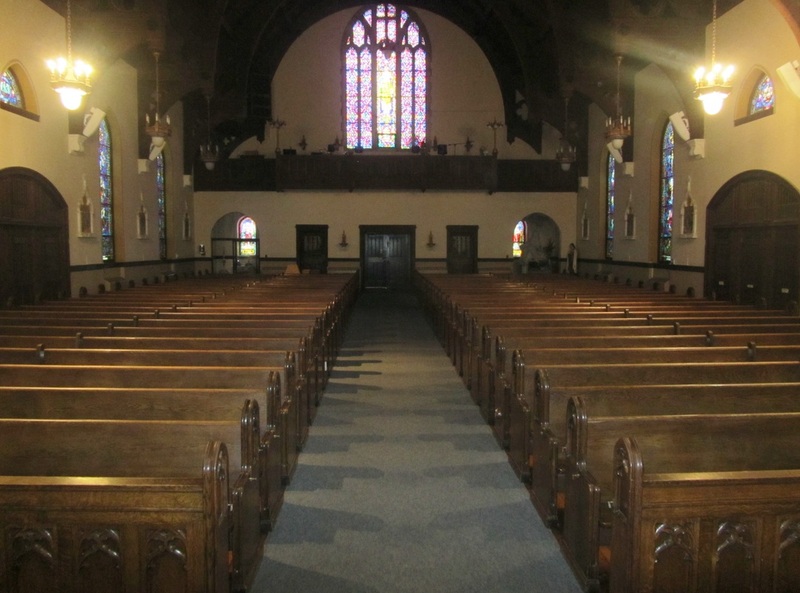 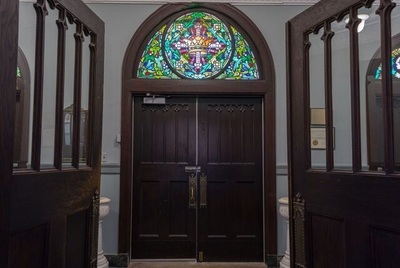 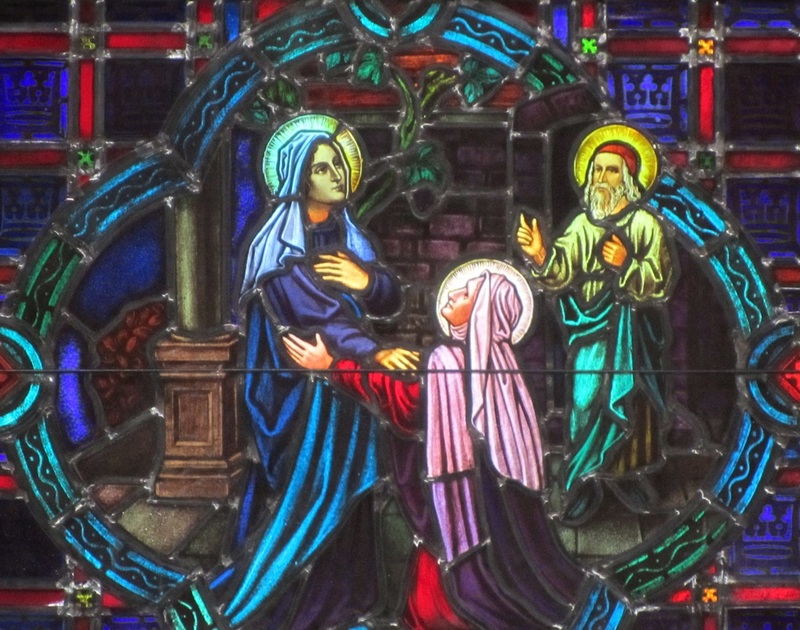 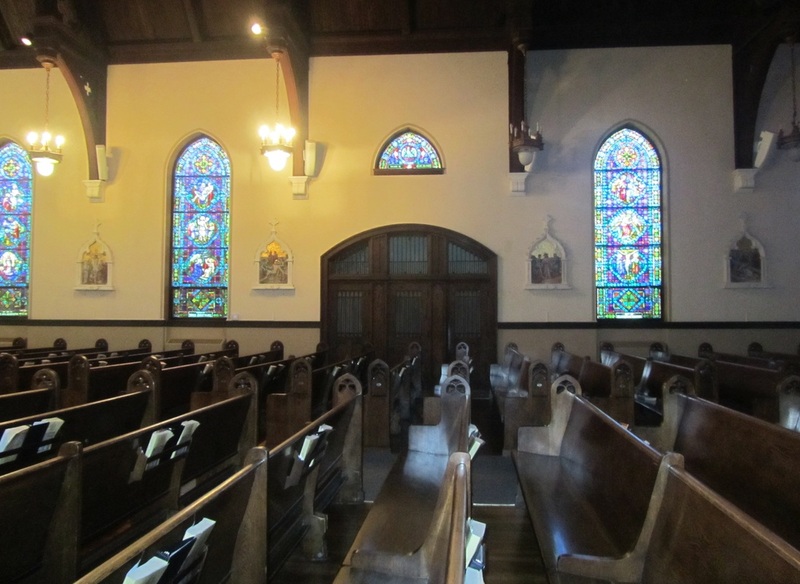 There are ten main stained glass windows in the 1915 church. 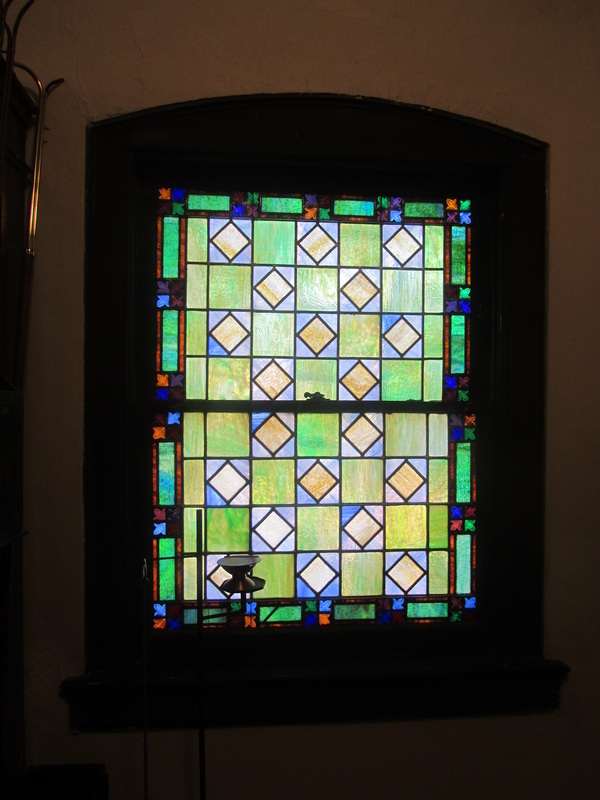 Each window contains three picture panels Each panel relates a different bible story. 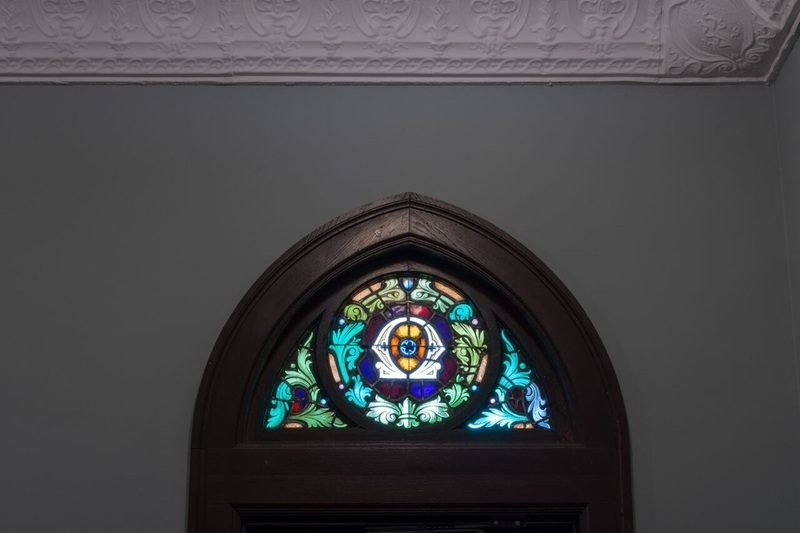 An art glass company has rated the windows a 9.5 out of 10 because of the depth and amount of blue and red in each window. 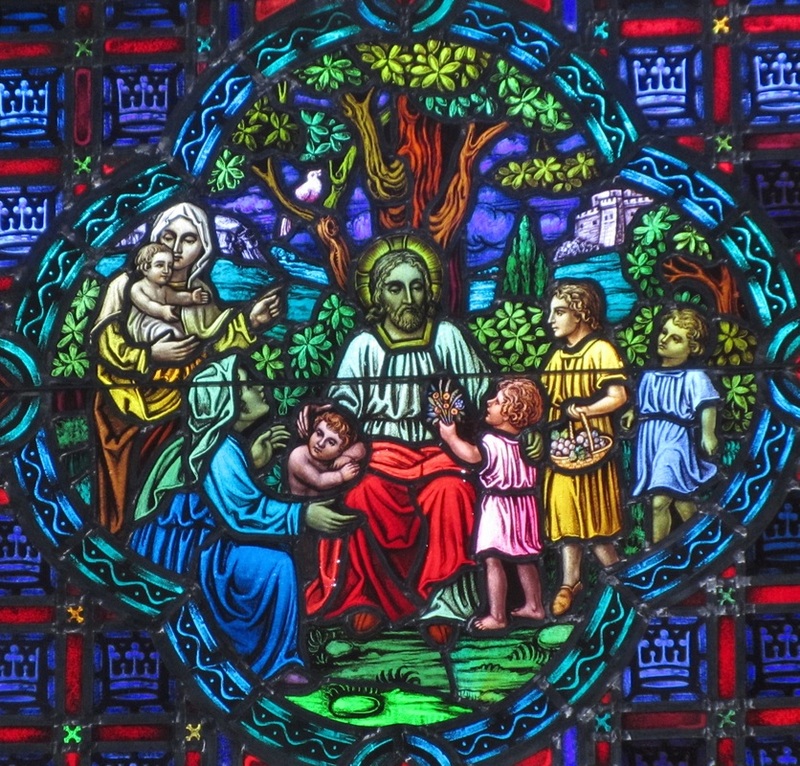 The ability to identify trees and flowers in stained glass windows is a testament to the talent of the artist(s) who made them. 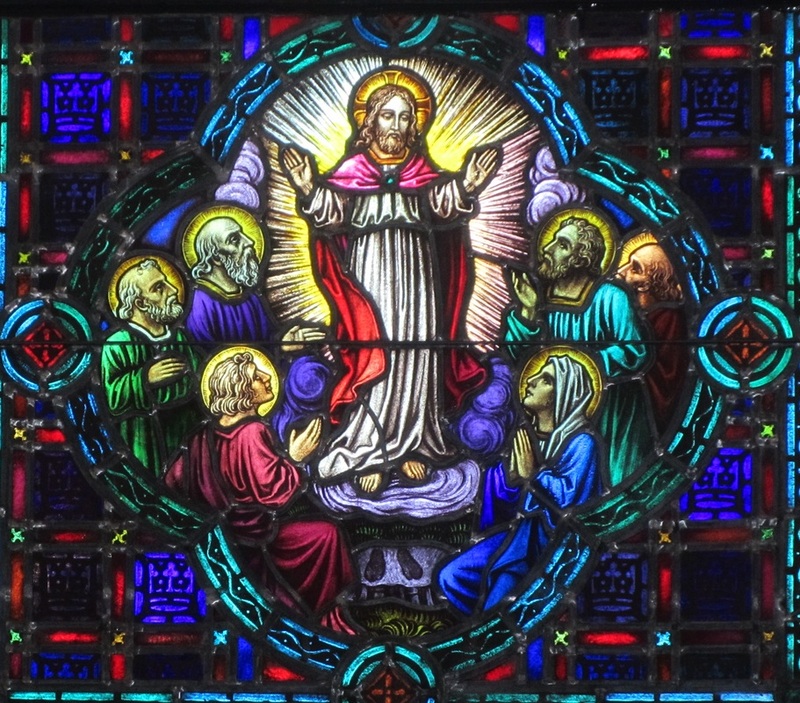 Notice the footprints left on the ground as Jesus ascends into Heaven. 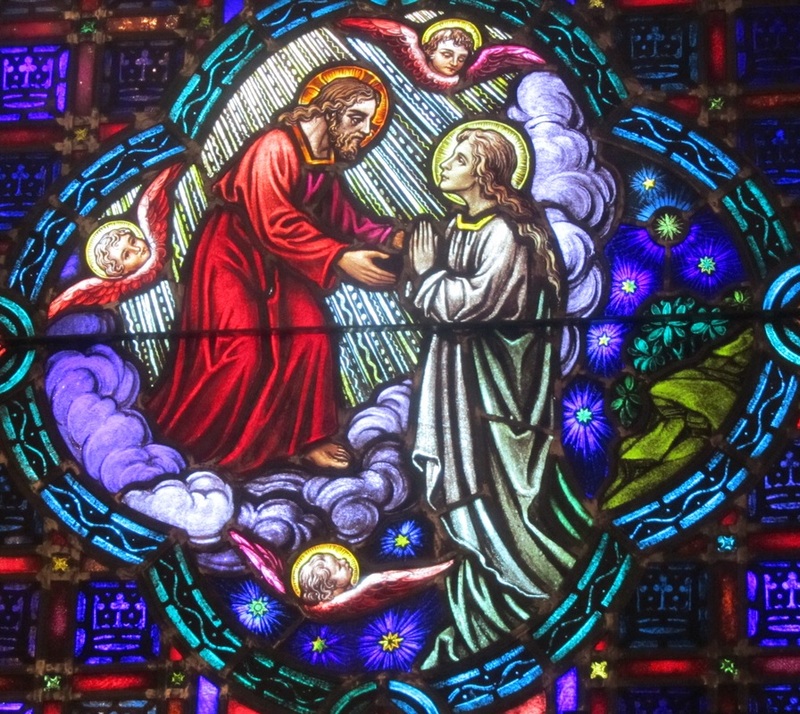 The assumption of Mary body and soul into Heaven. 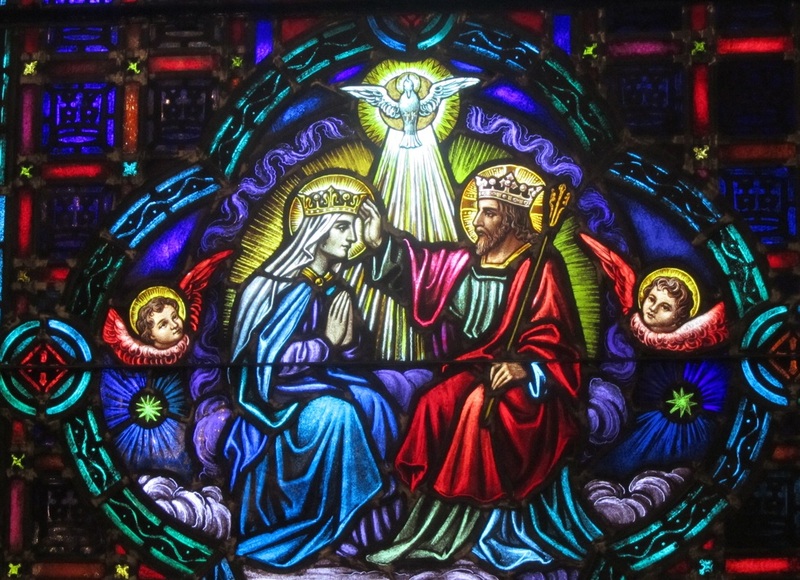 The coronation of Mary as queen of Heaven and earth. 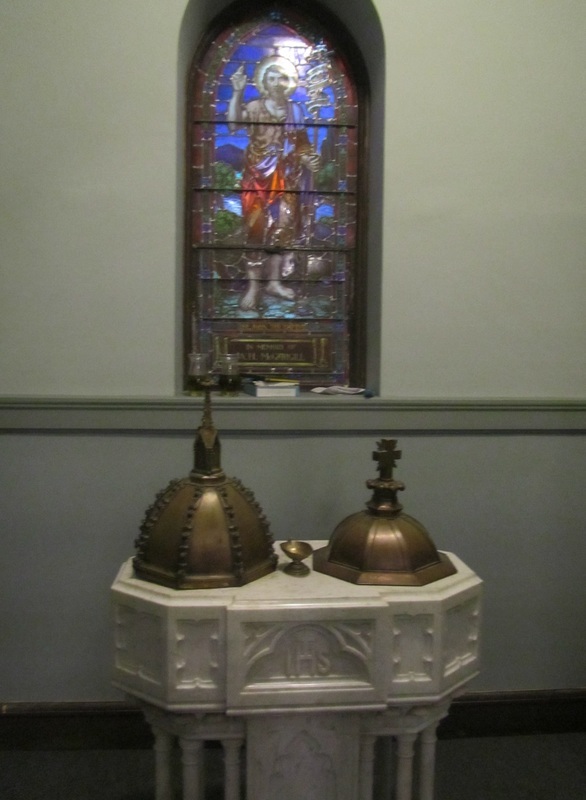 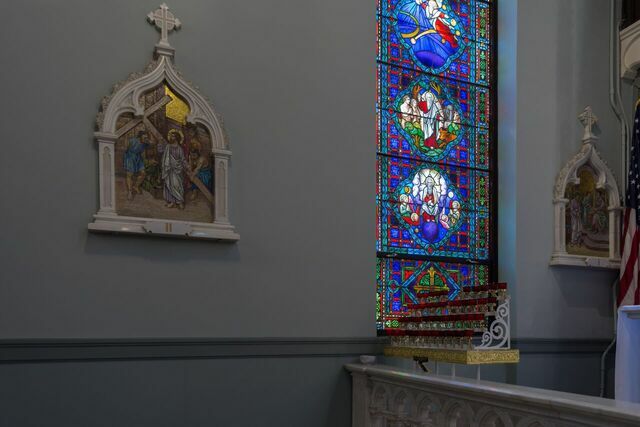 The Pelican in her Piety window is located above the east confessional. 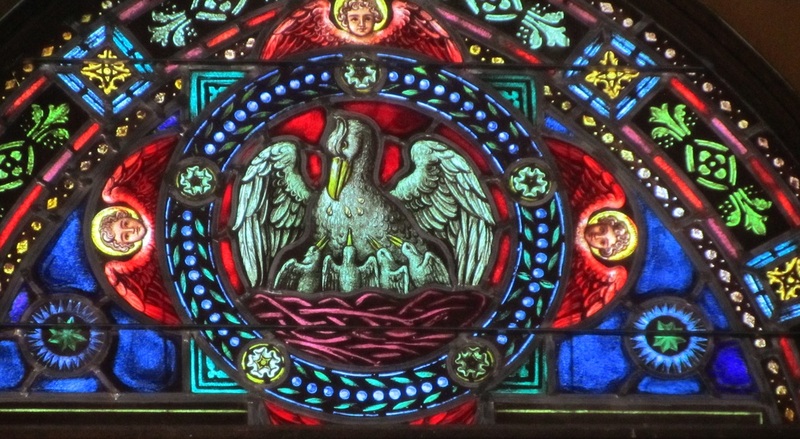 It is said that in times of famine the pelican pecks at her chest and feeds her young with her blood. 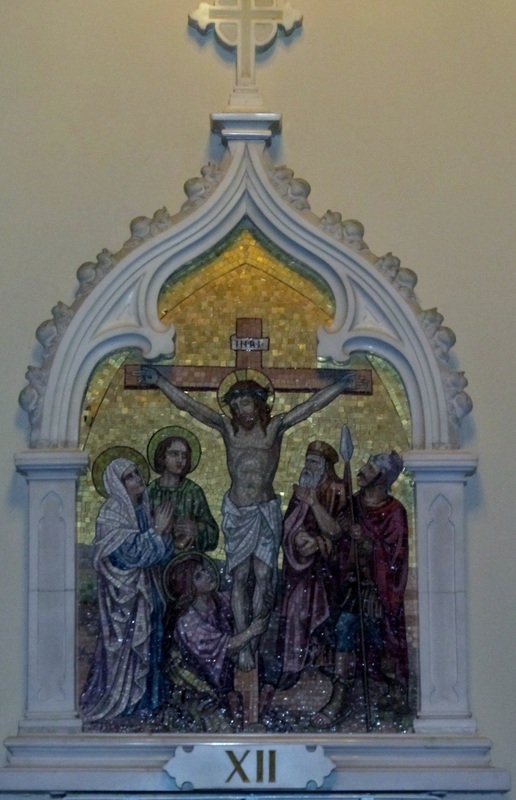 It represents Jesus shedding His blood to save mankind. 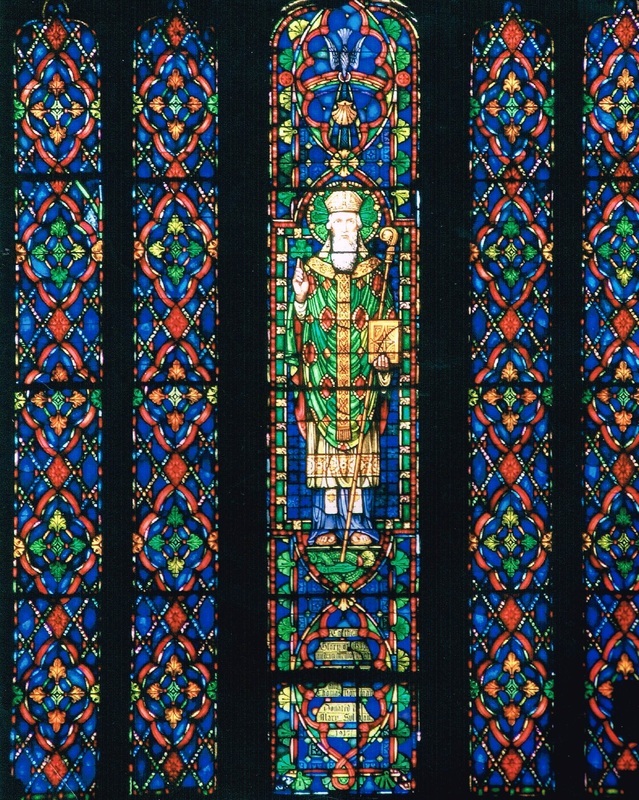 Choir loft window - Father Hayes sent the panel with the face of St. Patrick back three times; since nobody really knows what St. Patrick looked like, there is thought it might be the face of Fr. 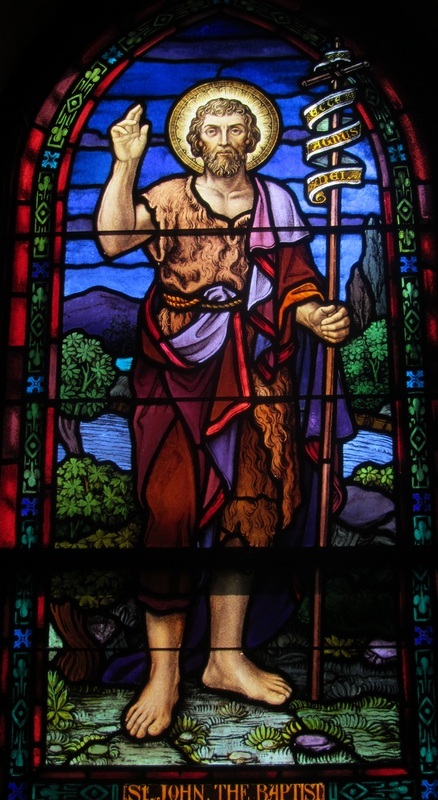 Hayes in the window. 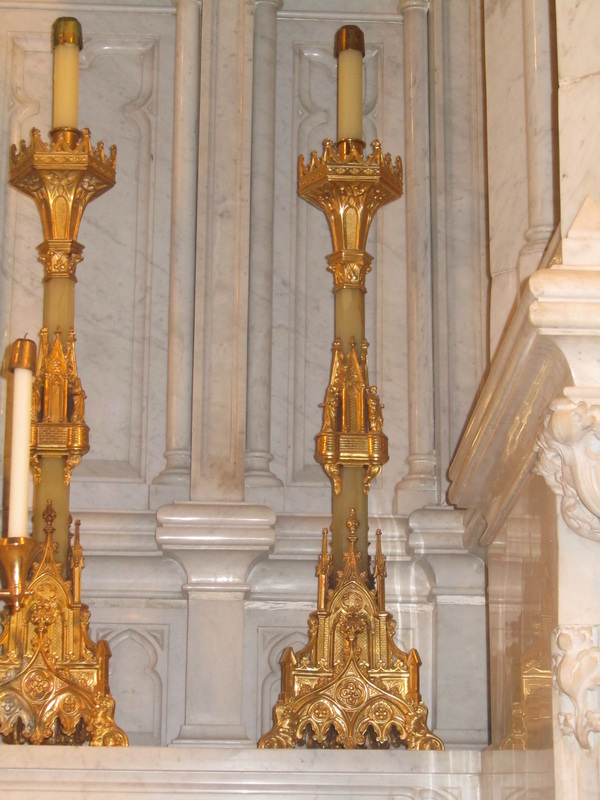 State of the art speakers first used September 21, 2014. 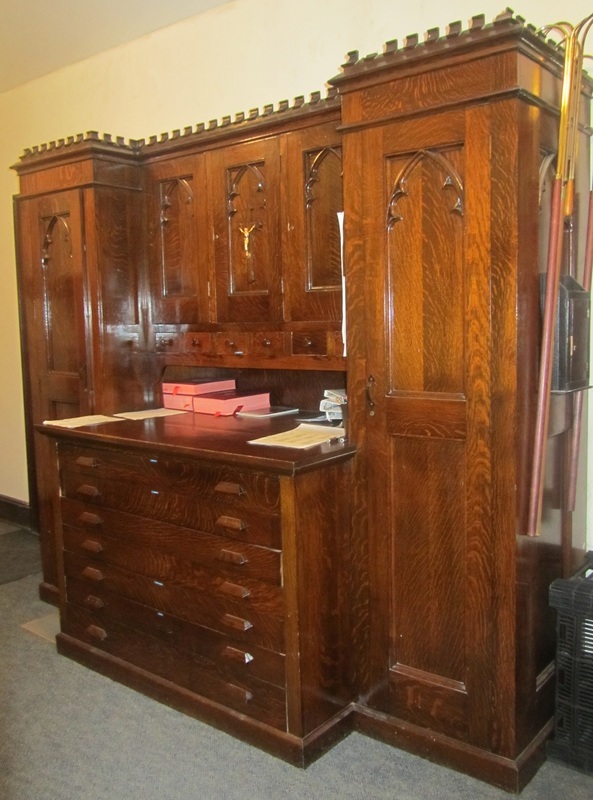 The vestment cabinet in the sacristy is made of tiger wood. 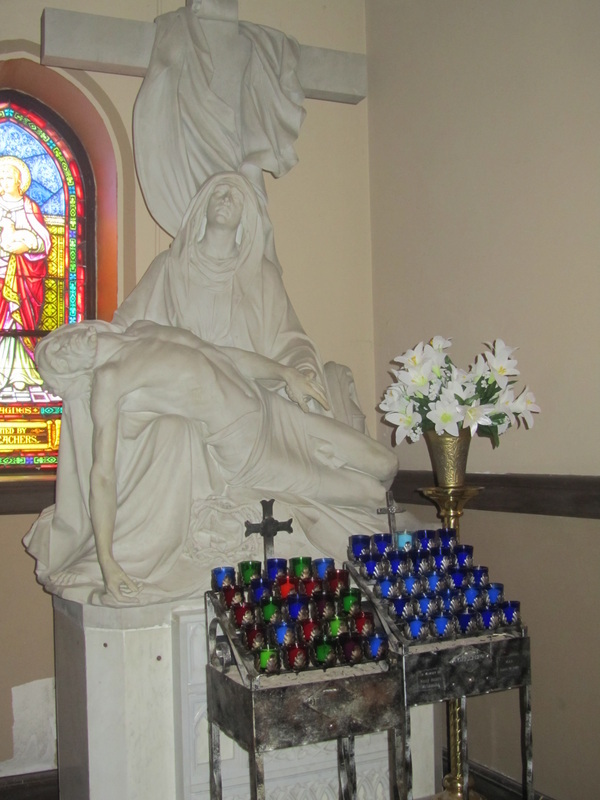 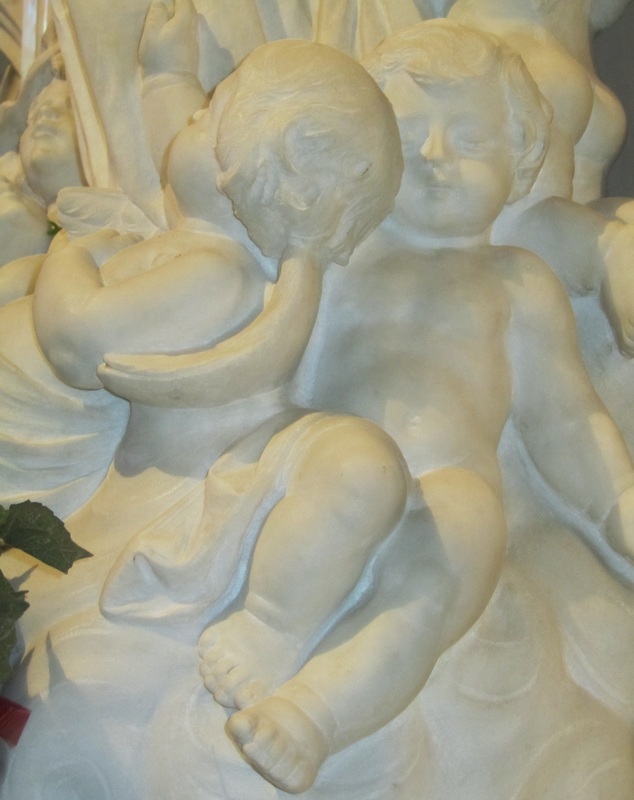 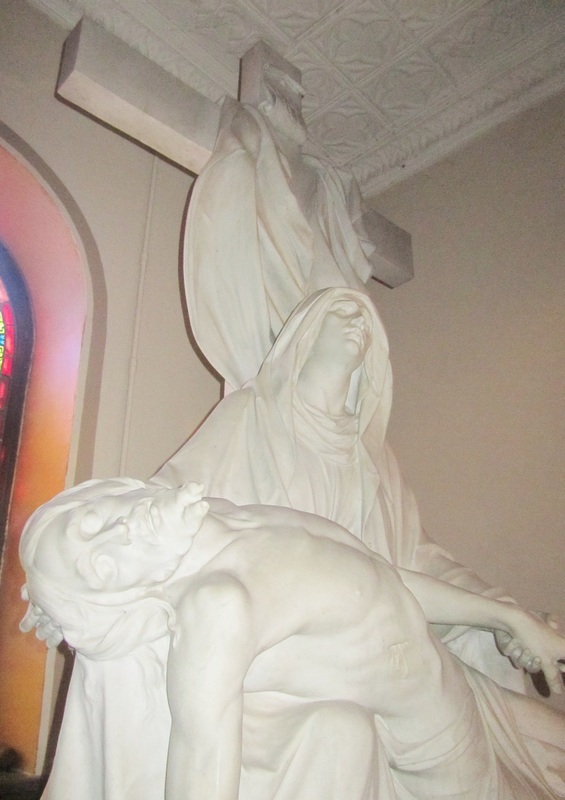 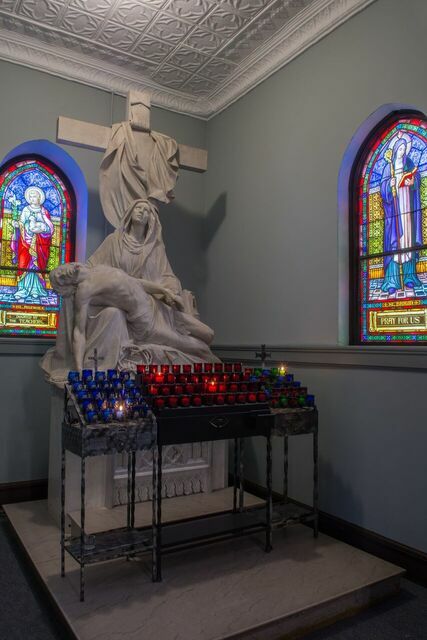 The Pieta is located in the SW corner of the church. 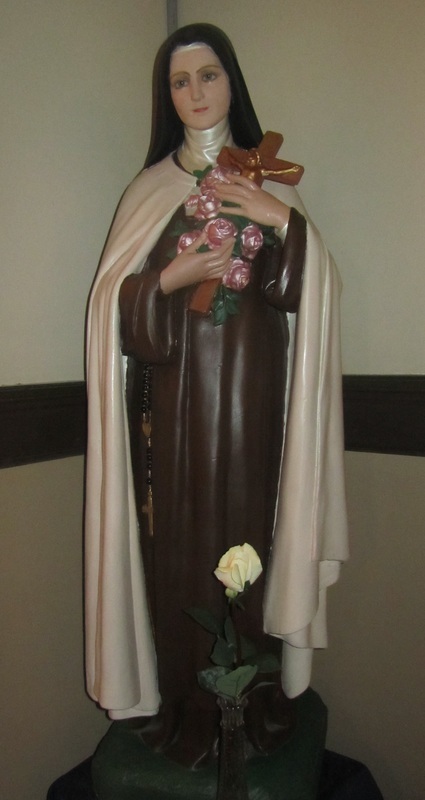 Fannie Martin was in her 90's when she restored the beauty of the St. Therese statue. 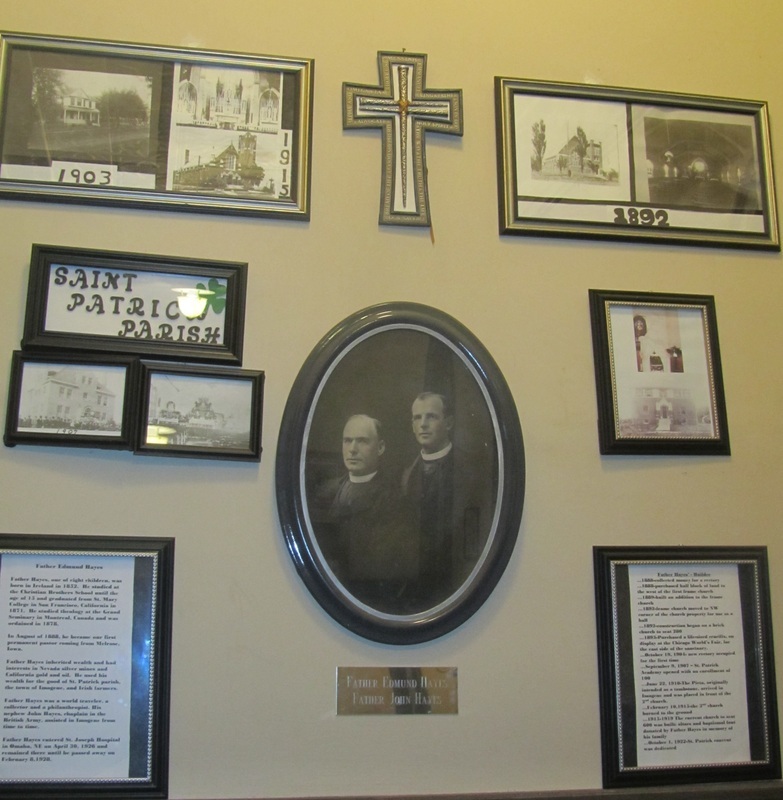 Vestibule historical display-Father Edmund Hayes on the left and his nephew Father John Hayes on the right (chaplain in the British Army). 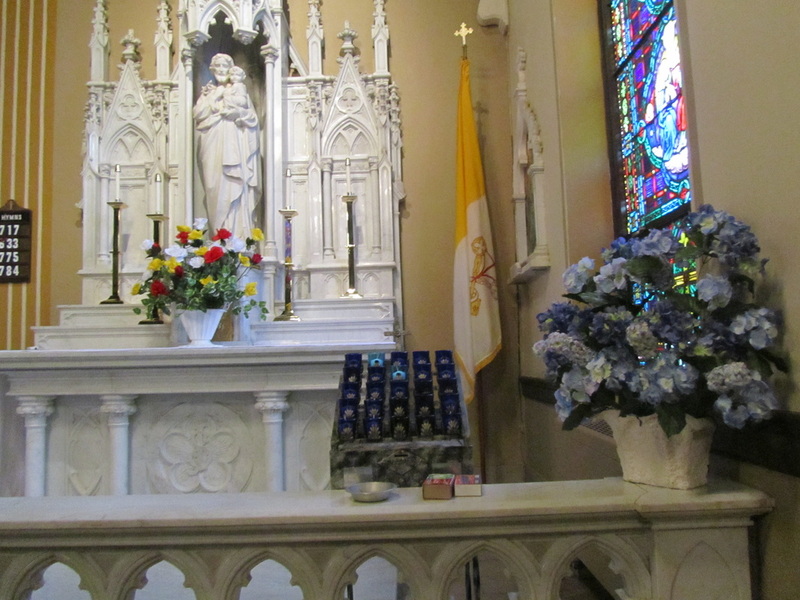 Father John would come for extended visits and help in our parish. 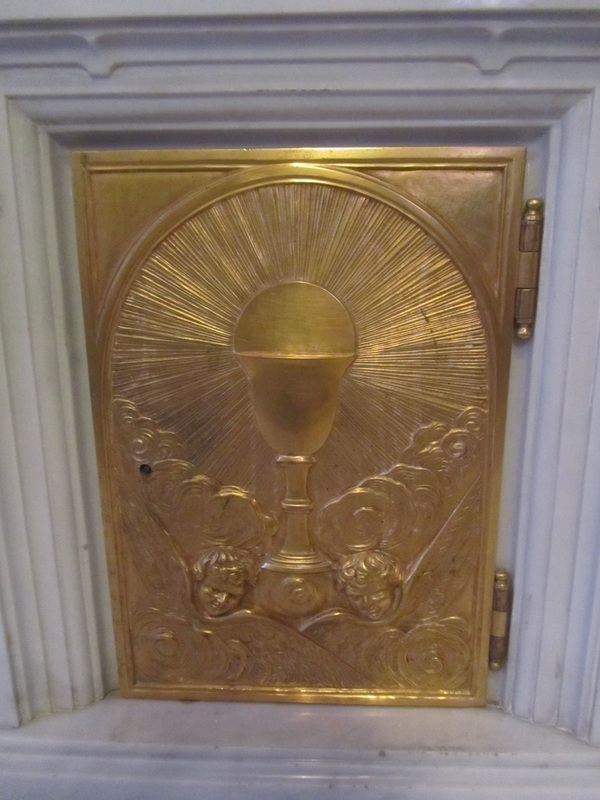 Reliquary formerly in front of the crucifix on the old main altar is said to hold a relic of the True Cross. 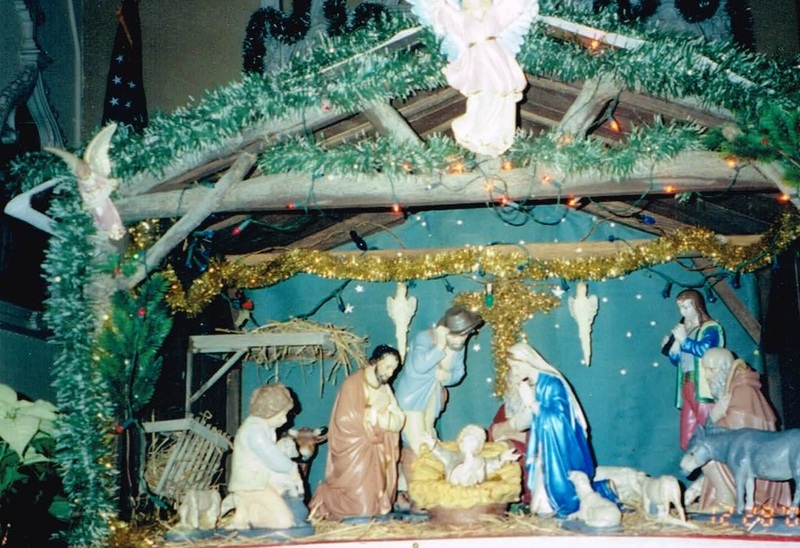 Nativity-placed each Christmas in front of Mary's altar; stable made by local carpenter John Thomas. 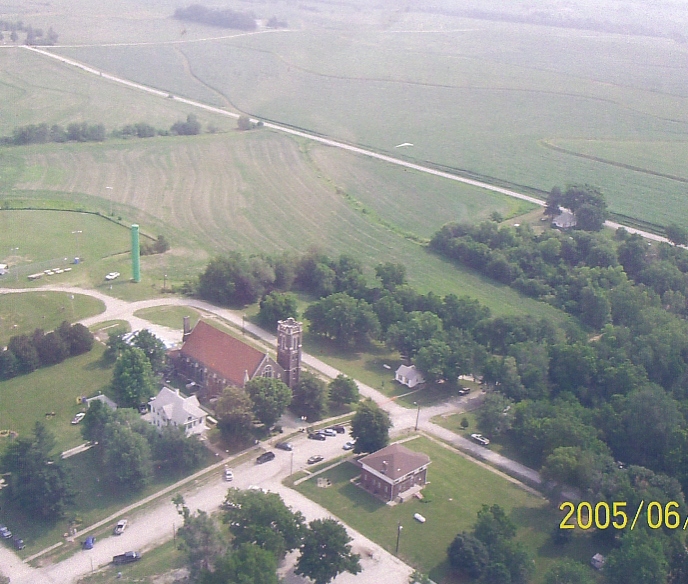 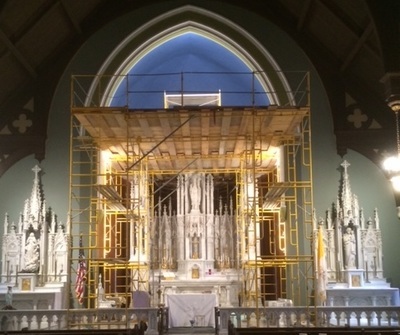 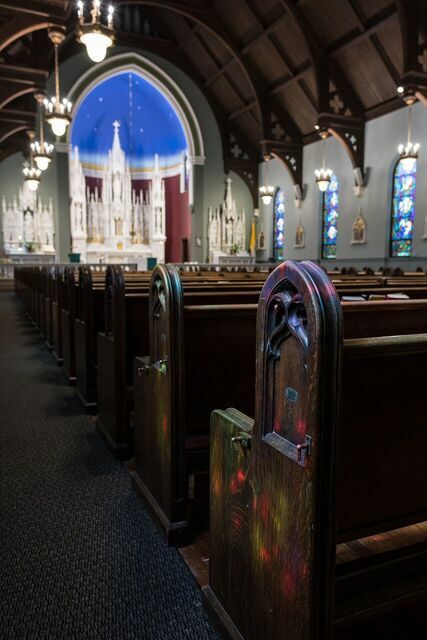 The church was repainted in 2015 prior to the 100 year centennial of the building of the church. Photos were taken by Colleen Laughlin.